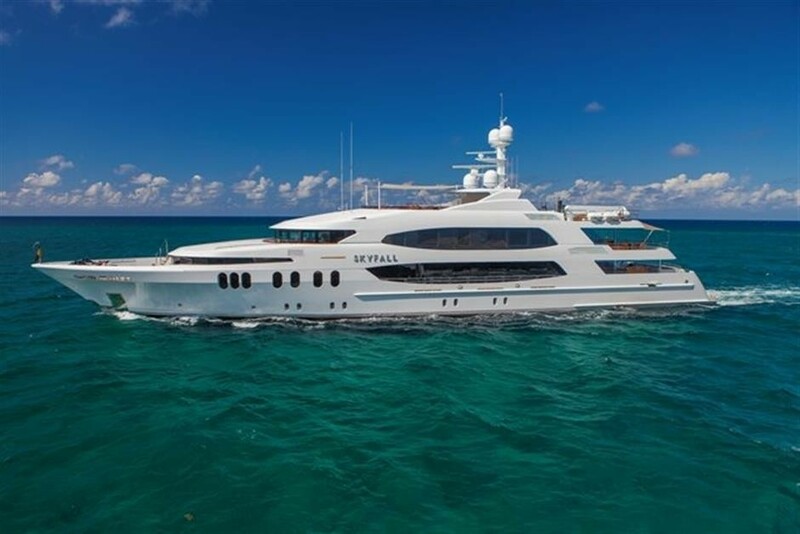 Motor yacht SKYFALL (ex Mi Sueño) represents a modern combination of the latest marine technology and exquisite styling. 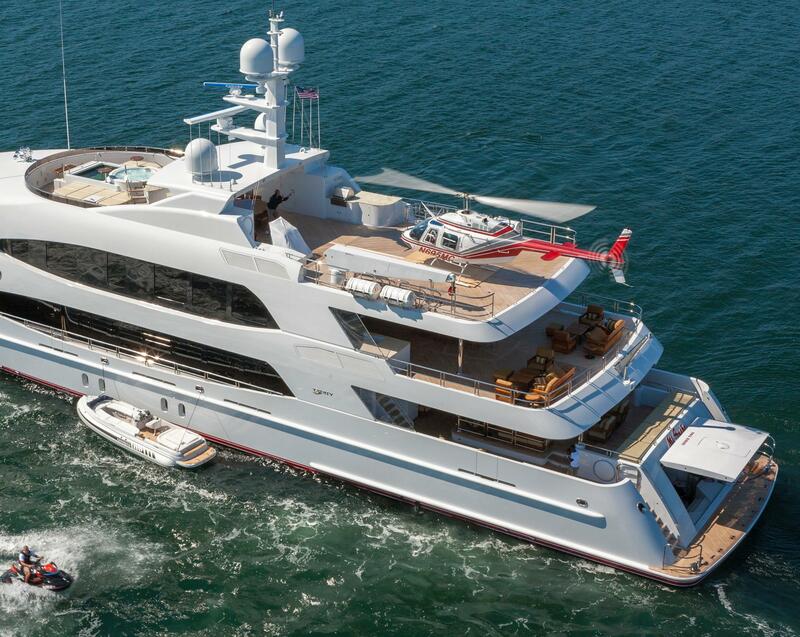 The yacht was launched in 2010 by Trinity Yachts. 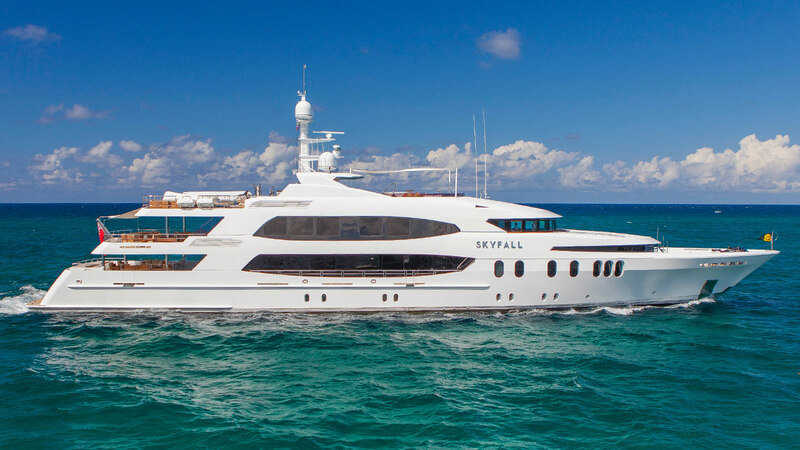 The 57-metre SKYFALL can accommodate up to 12 guests in six beautifully luxurious staterooms and has the added benefit of handicap access. 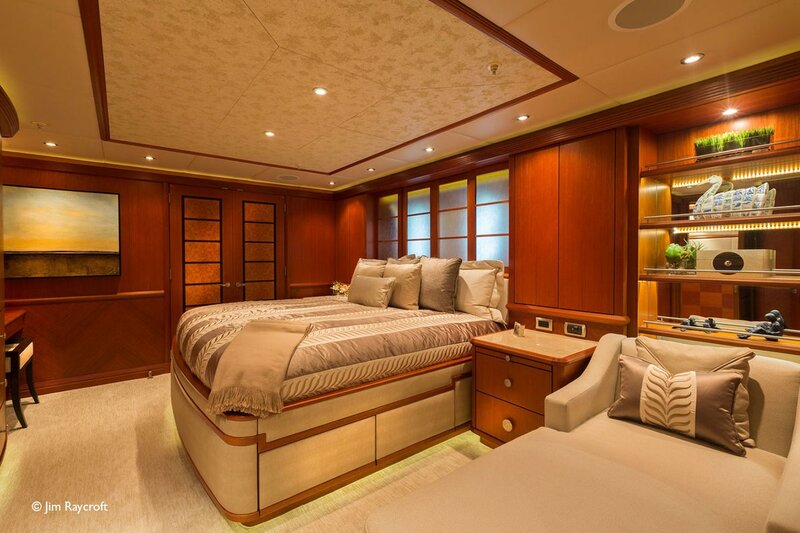 The cabins include one mater suite, 2 VIPs, three double and 1 twin cabin. 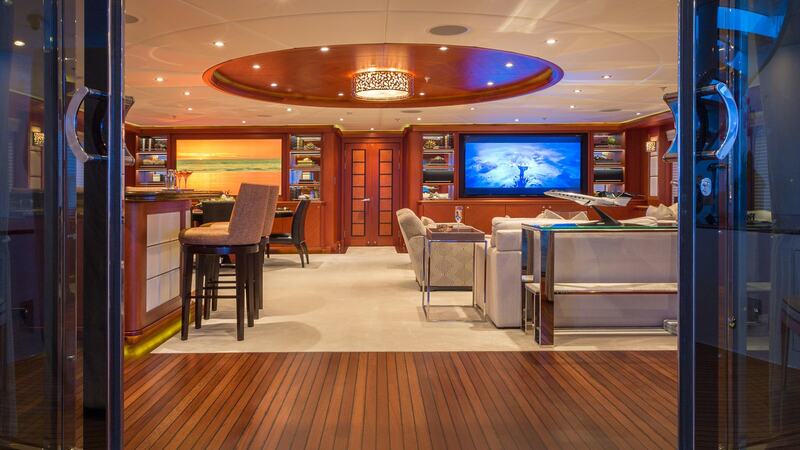 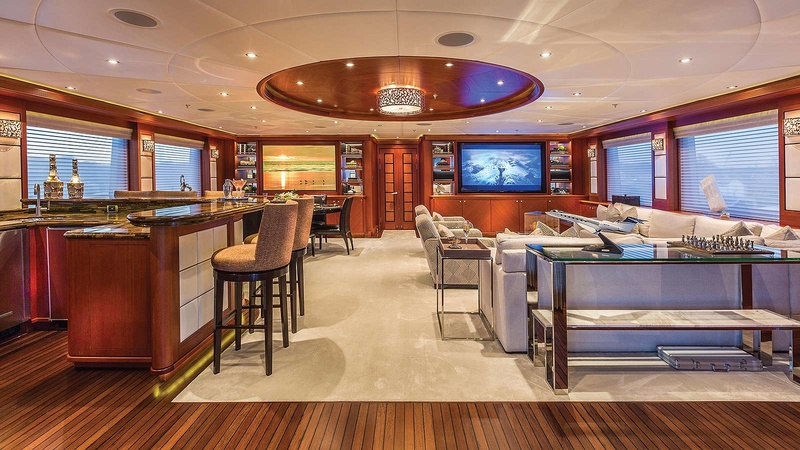 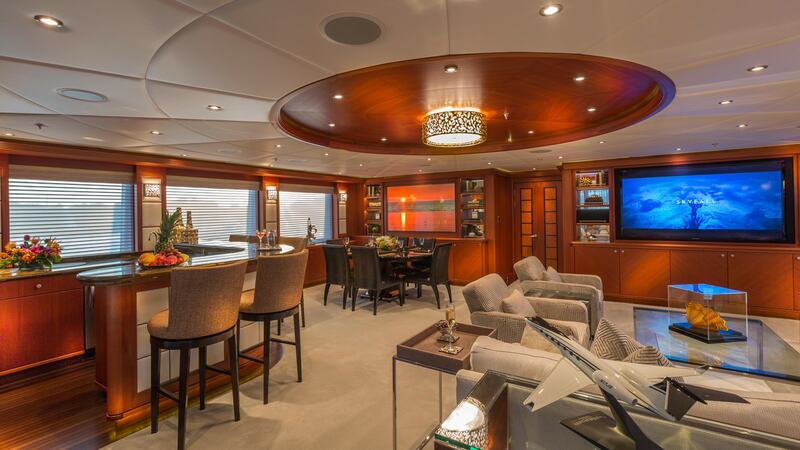 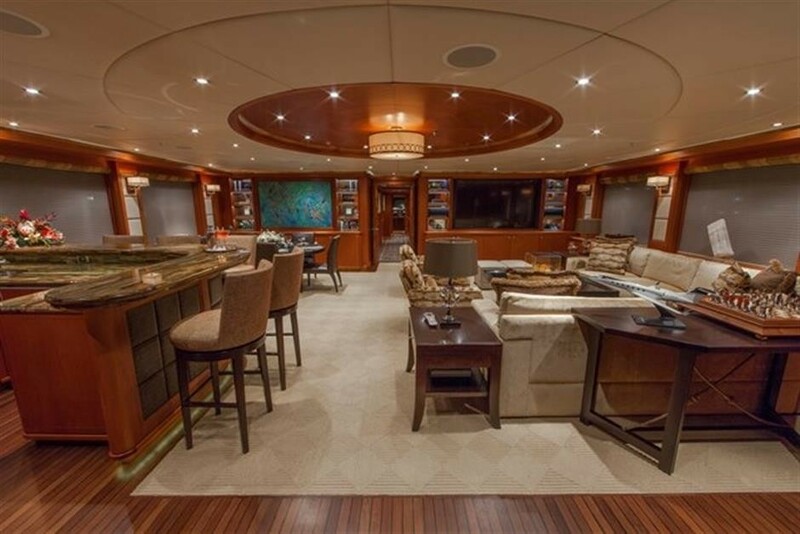 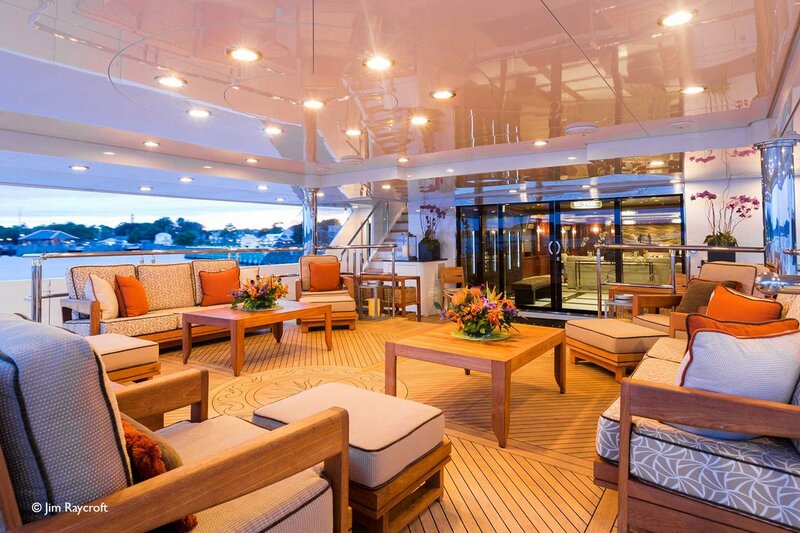 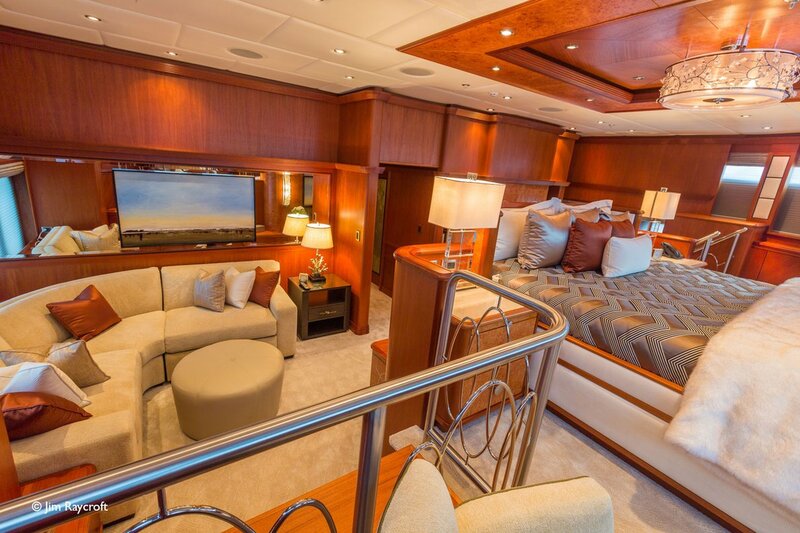 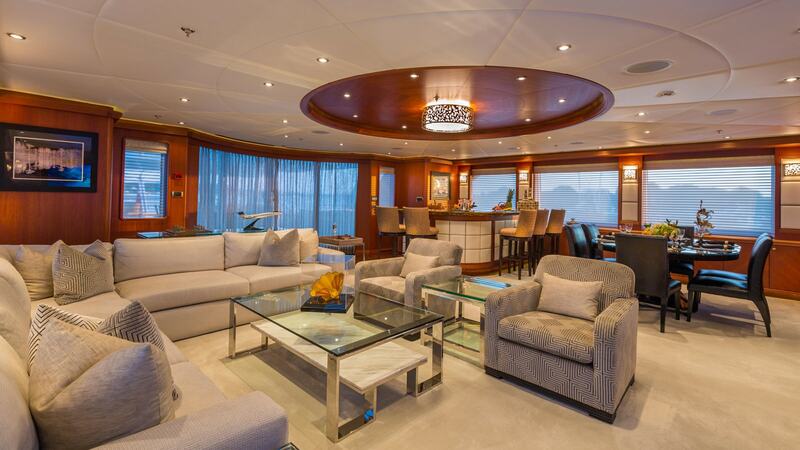 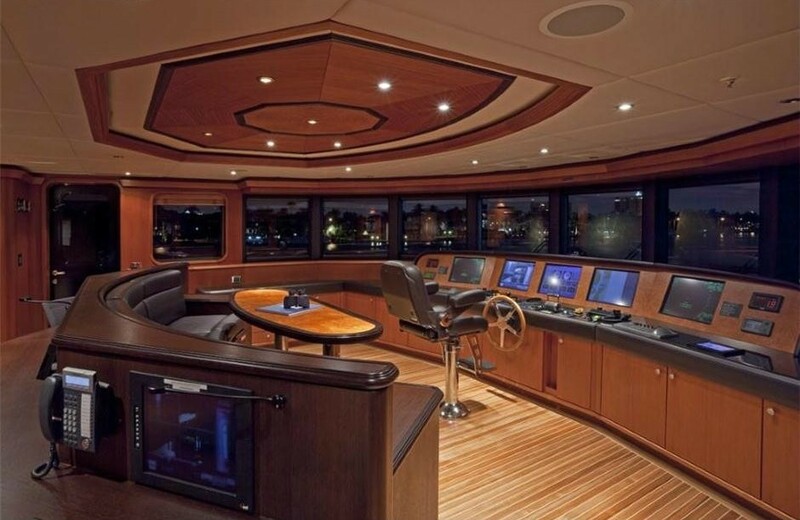 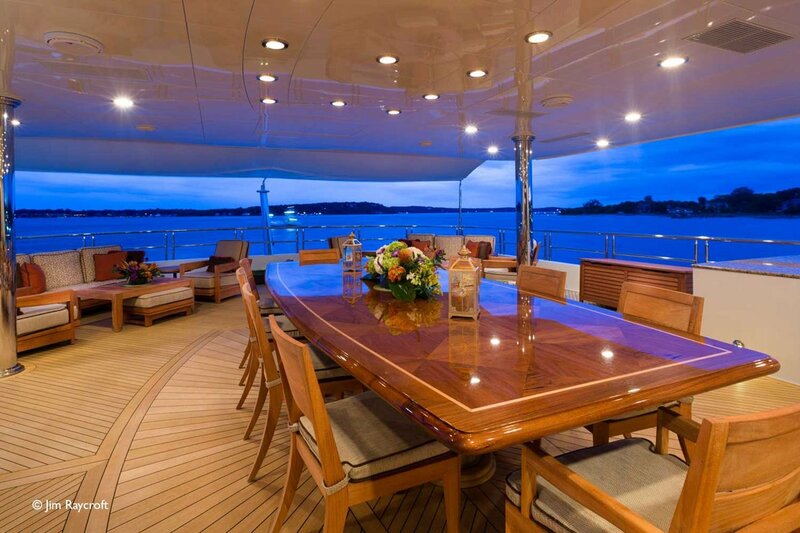 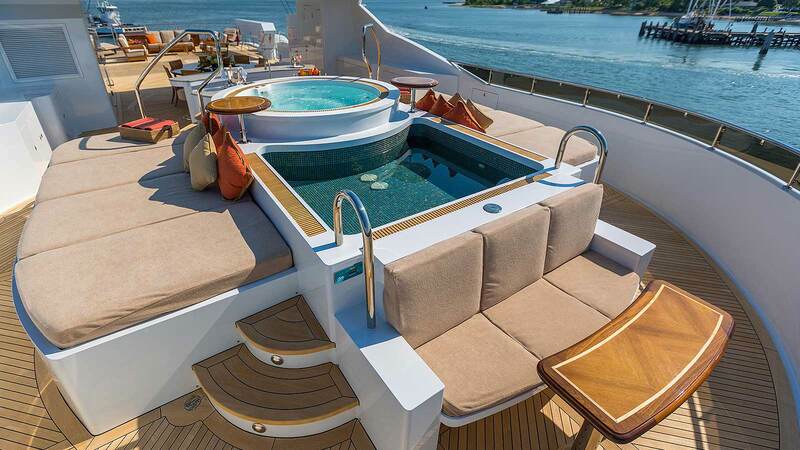 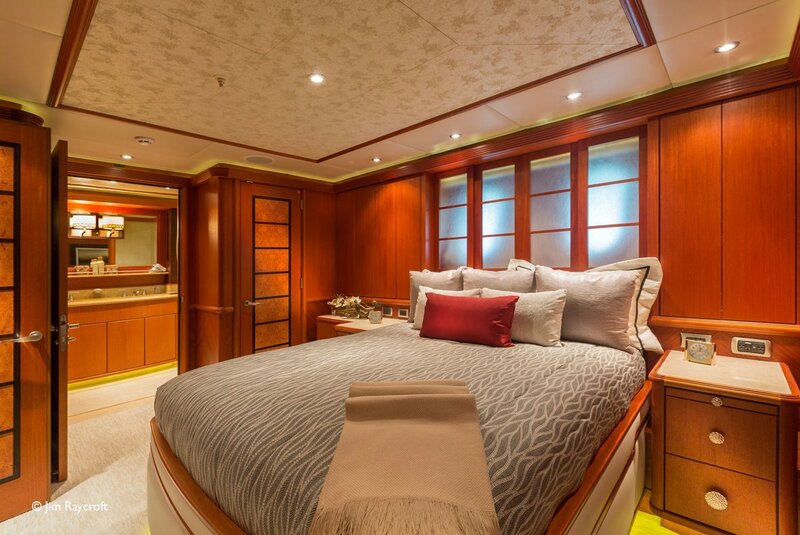 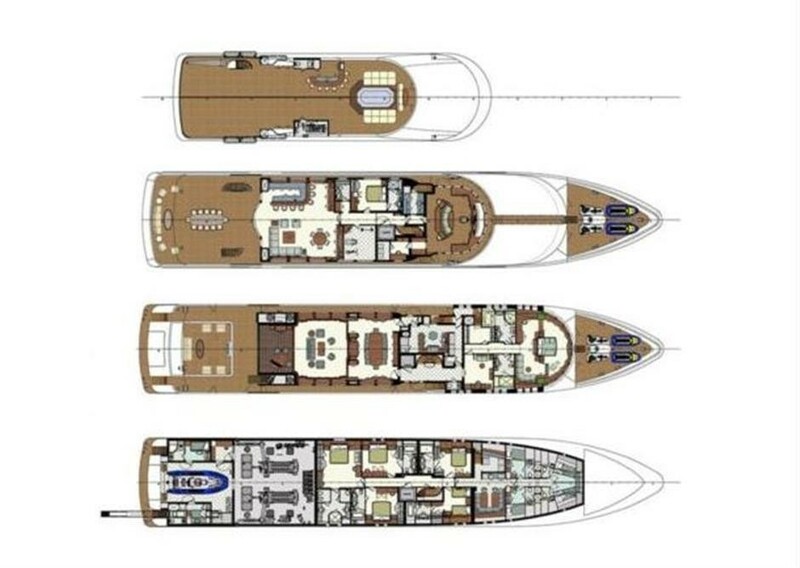 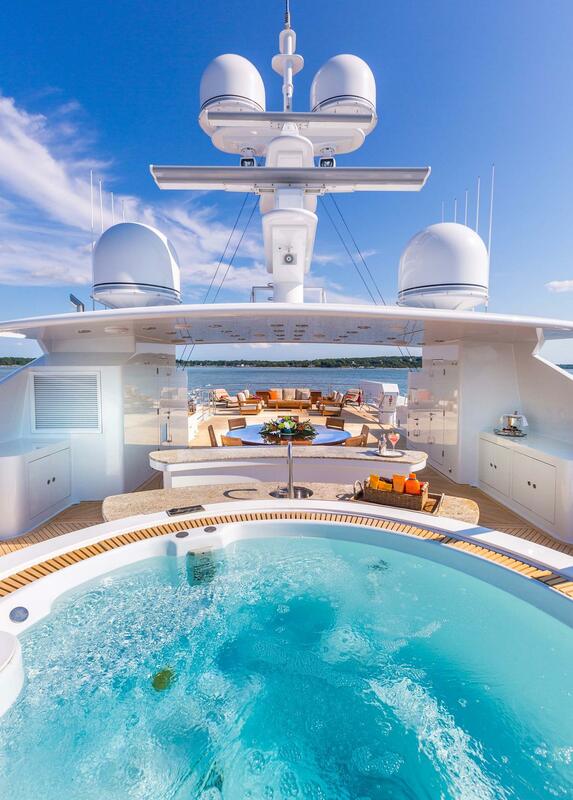 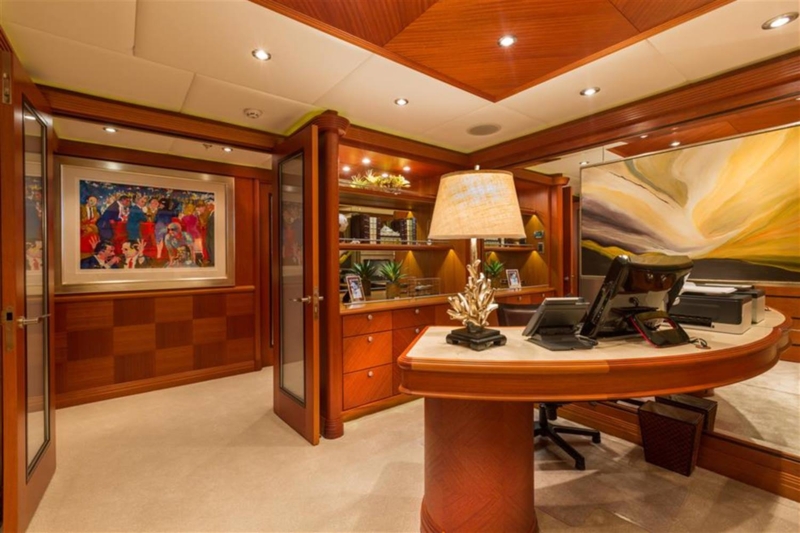 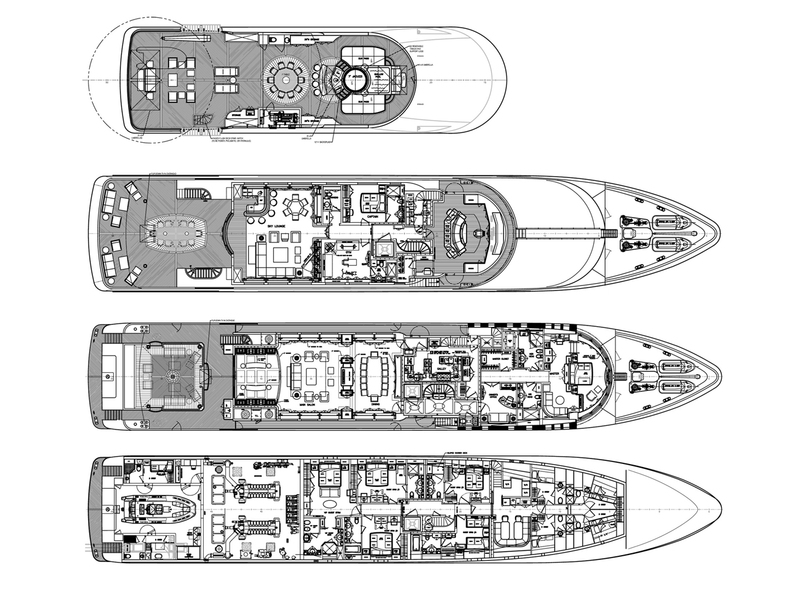 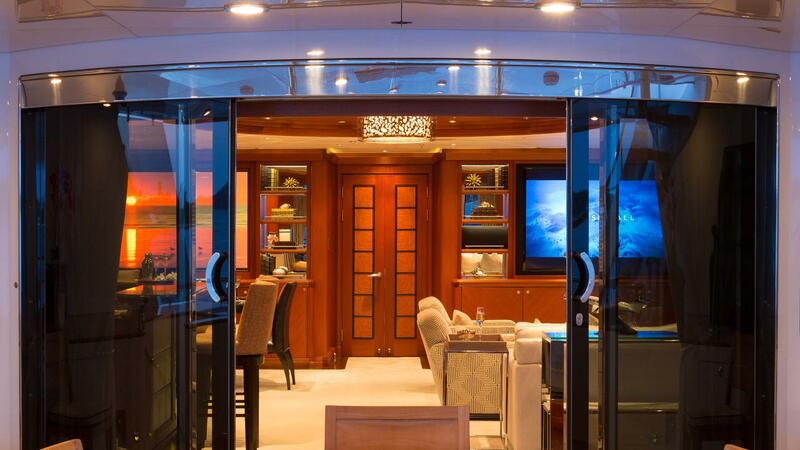 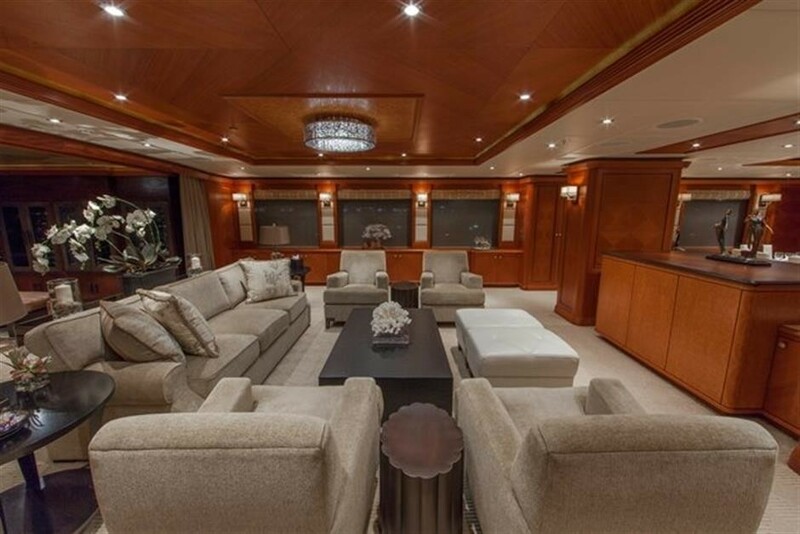 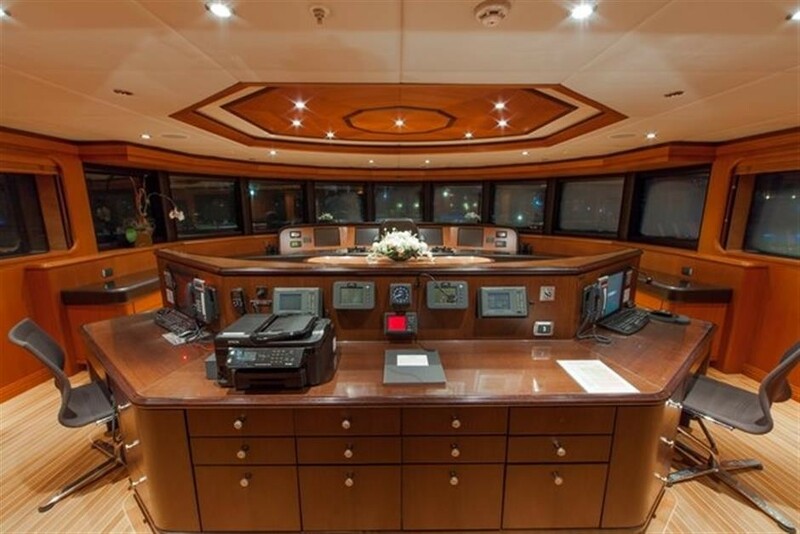 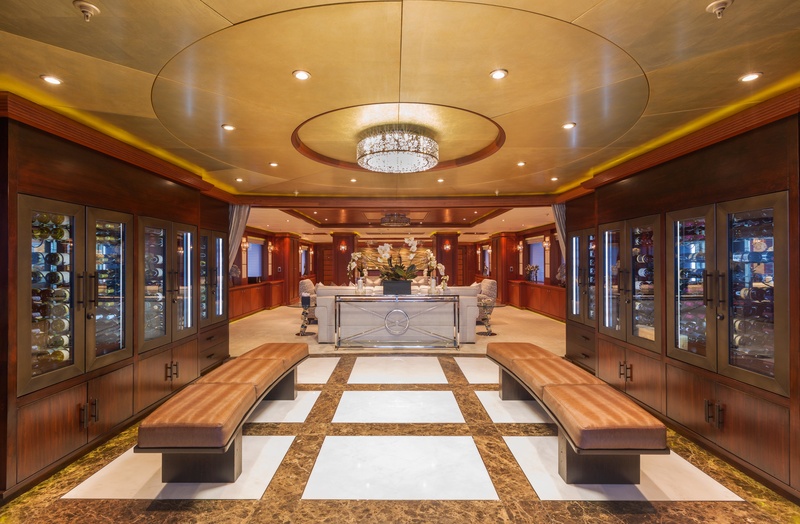 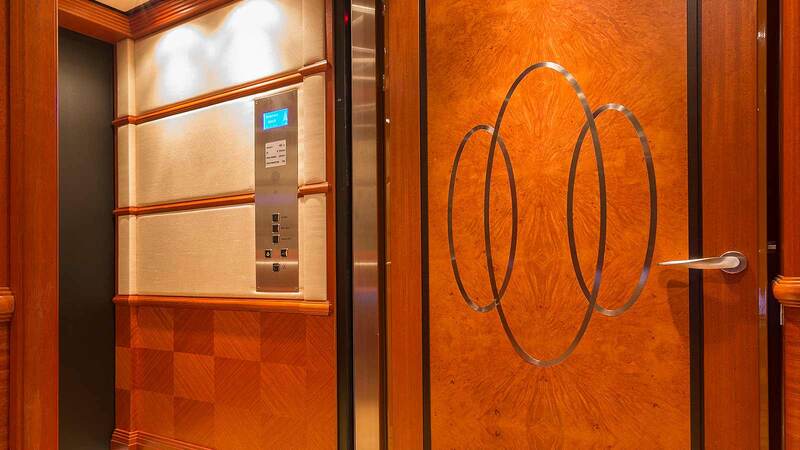 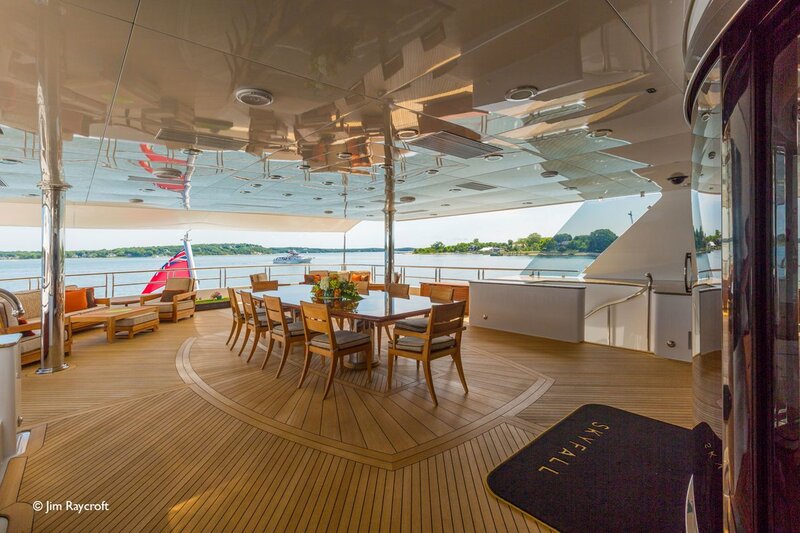 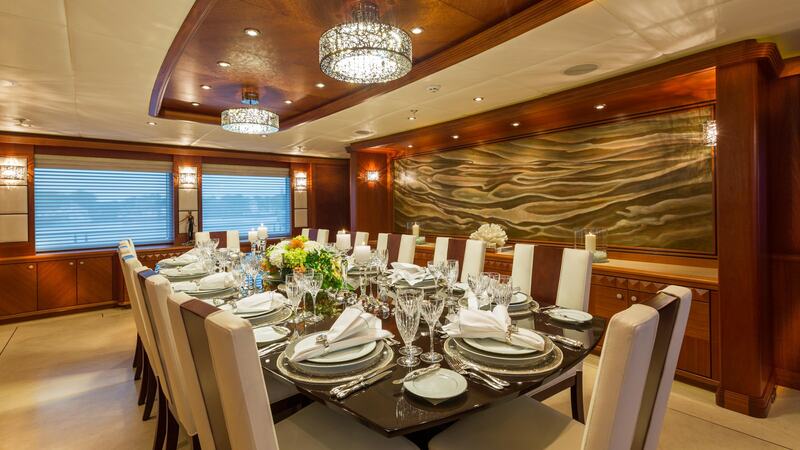 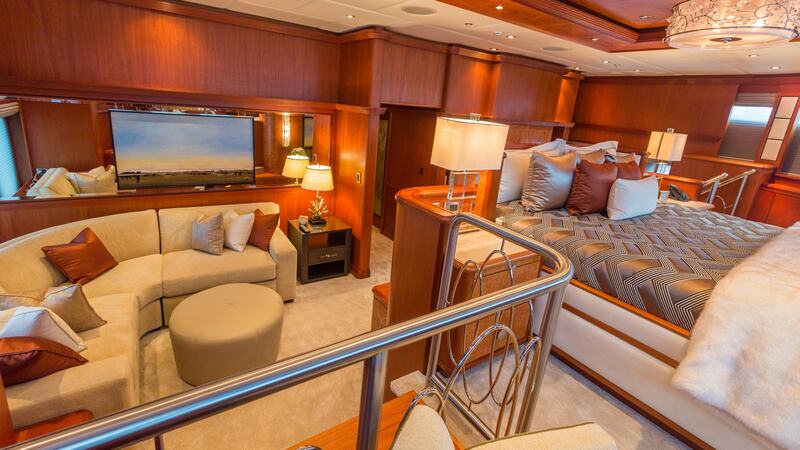 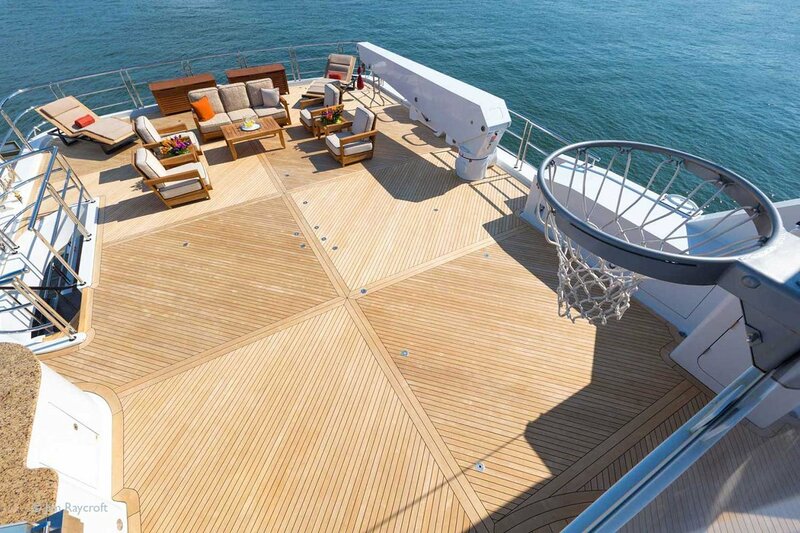 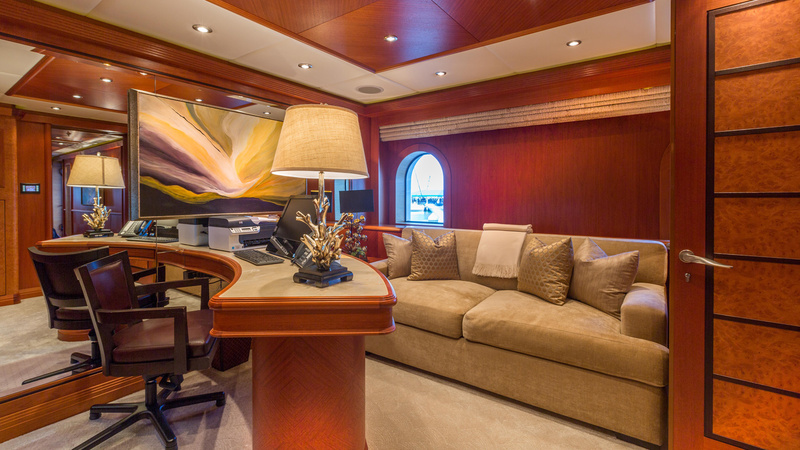 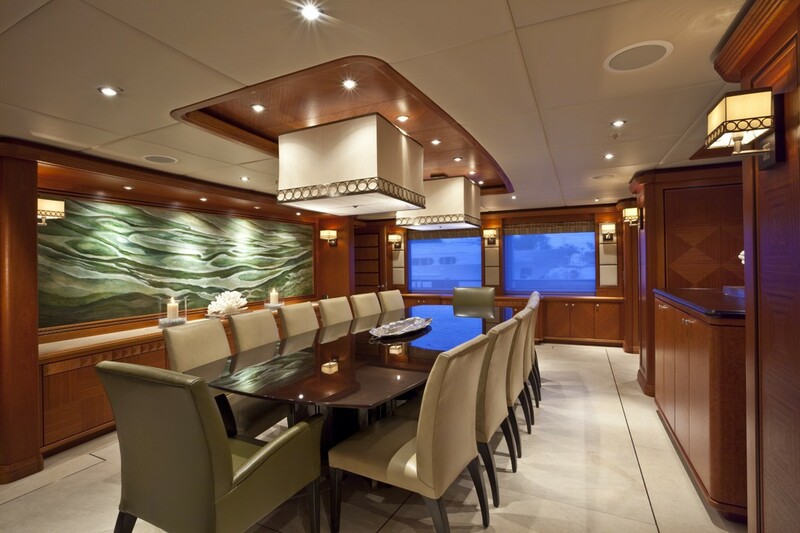 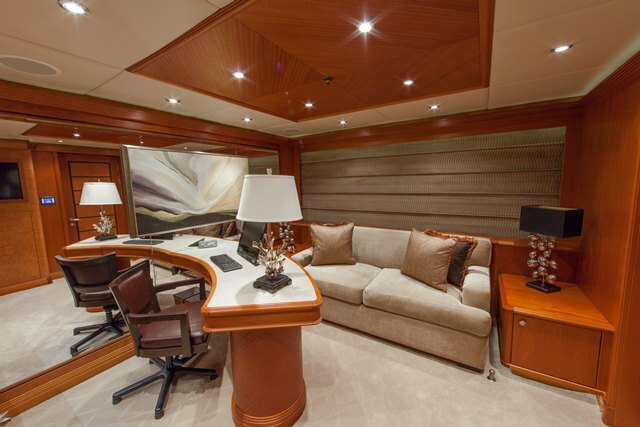 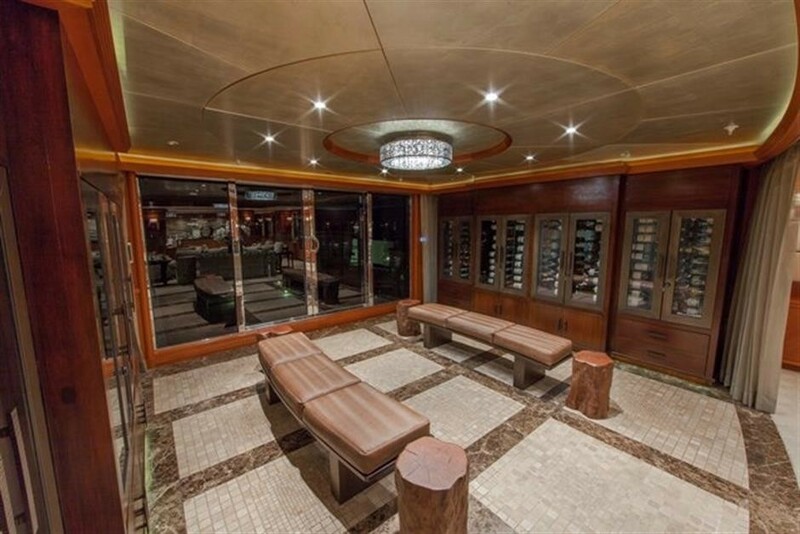 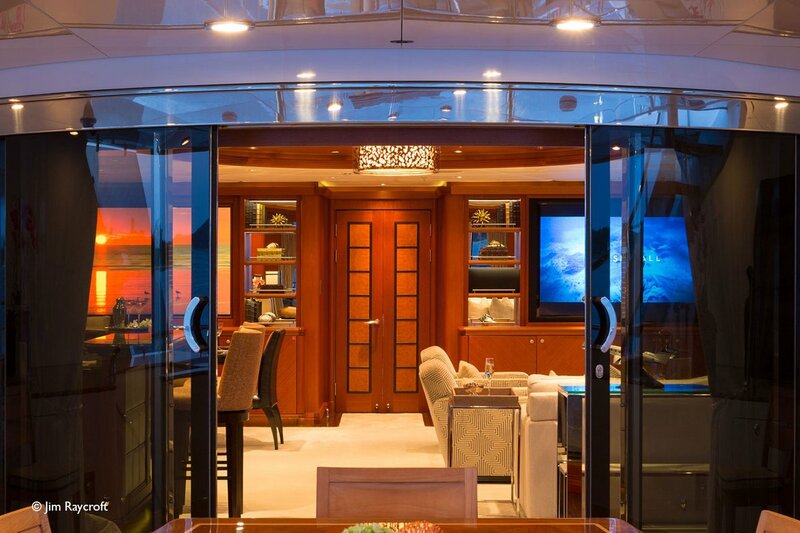 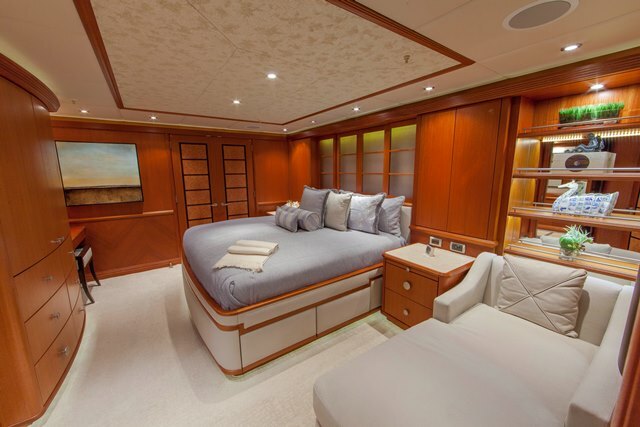 The interior design of the luxury motor yacht SKYFALL was designed by Patrick Knowles. 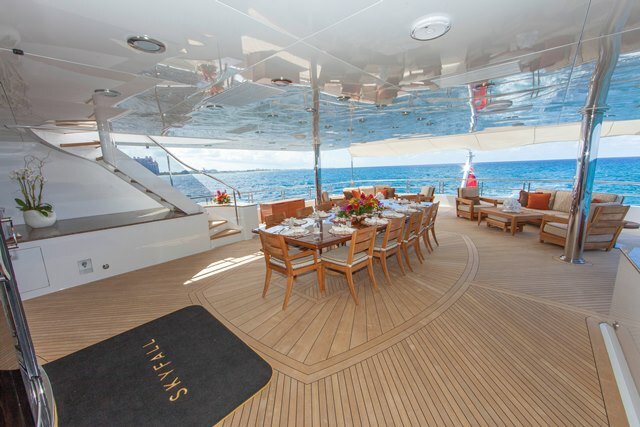 Trinity Yachts shipyard was founded in 1988 and to this day continues the proud tradition of high-quality craftsmanship, state of the art construction and engineering techniques. 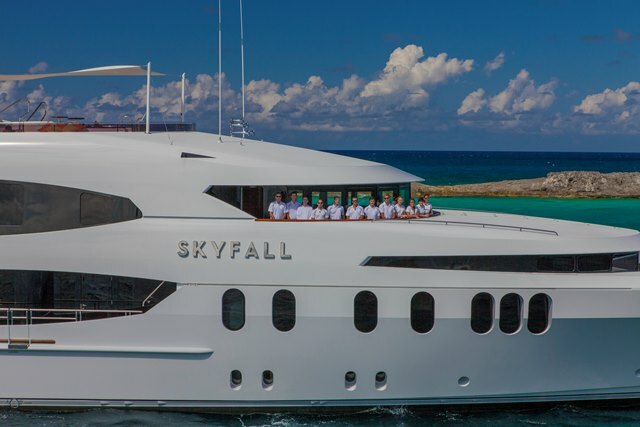 Luxury superyacht SKYFALL (ex Mi Sueño)'s efficient hull designs, propulsion and stabilising systems for the best performance, seaworthiness and structural integrity; noise and vibration reducing materials for a maximum comfort or sophisticated engineering systems such as fresh air replenishment and black and grey water treatments are some of the results of Trinity Yachts Engineering excellence. 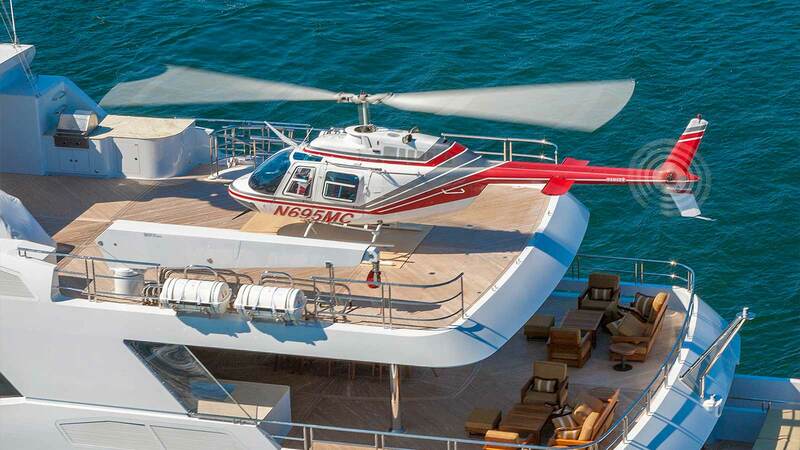 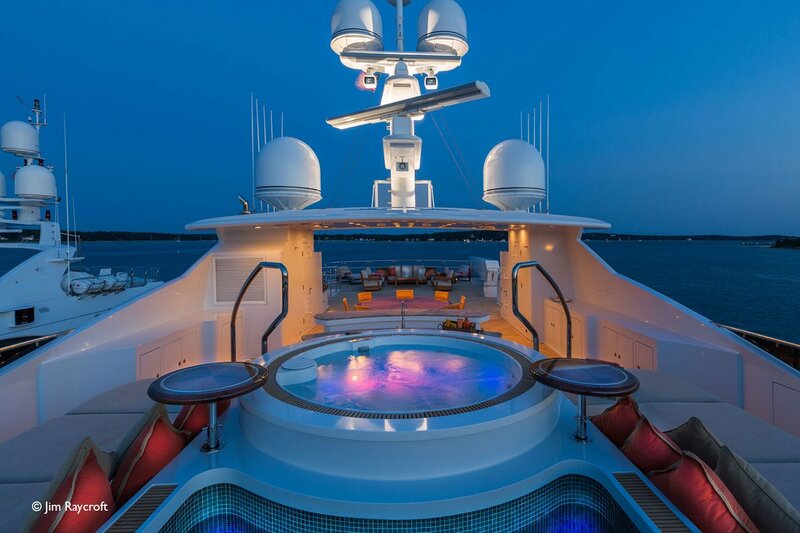 The deck equipment includes a Spa Pool for seven people, one hydraulic 22.5 ft. Marquip Passerelle, two 10 step manual shipside boarding ladders 24" Nautical Structures, one 5,500 lb. 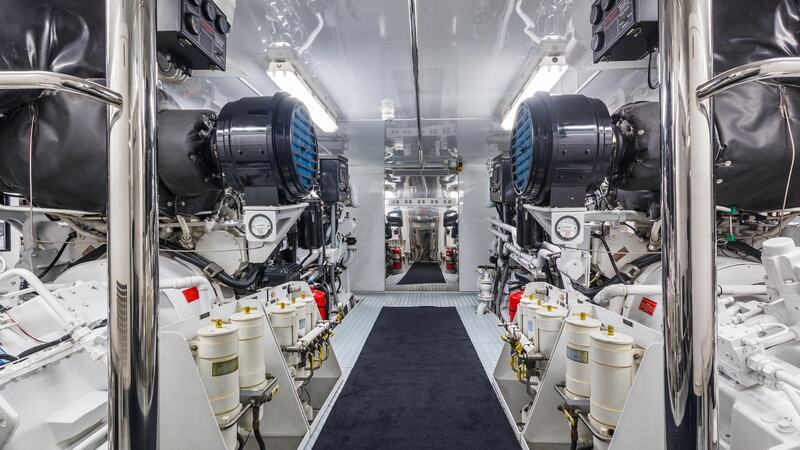 SKYFALL motor yacht is powered by two Caterpillar 3516 C-HD: 3,384hp, each at 1,800rpm engines. 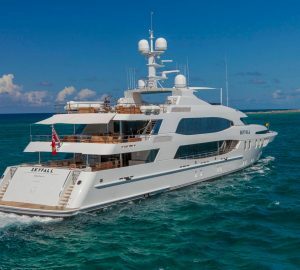 **Not offered for charter to US residents while in US waters. 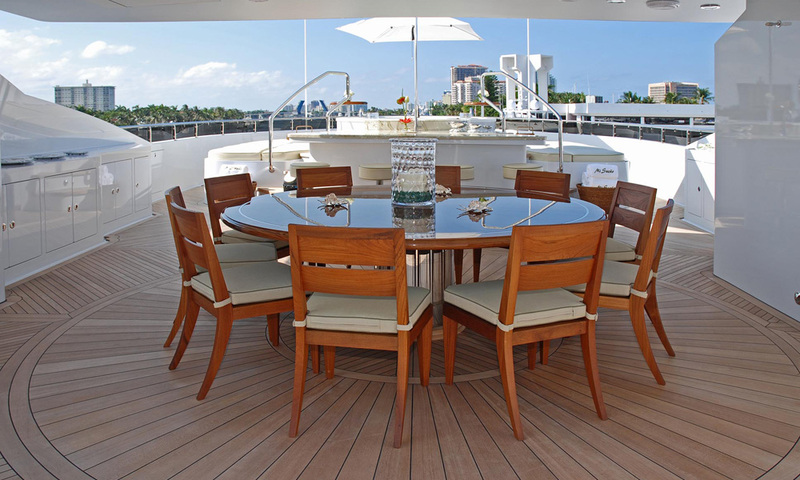 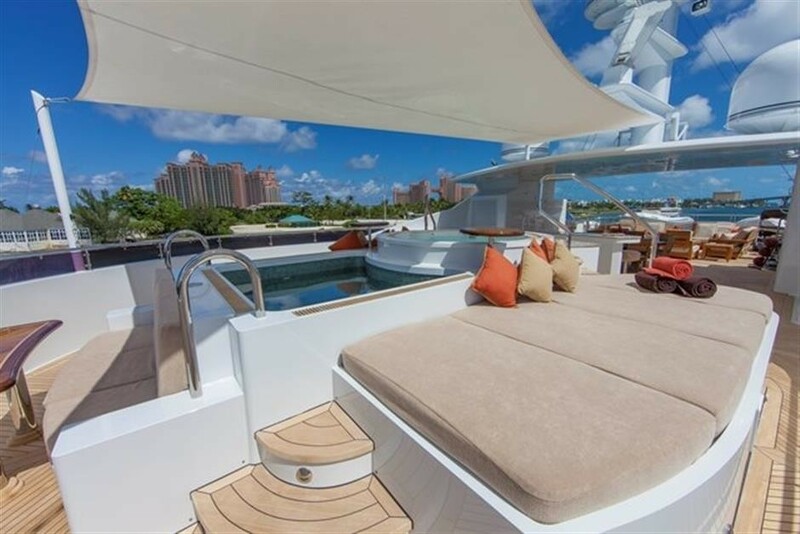 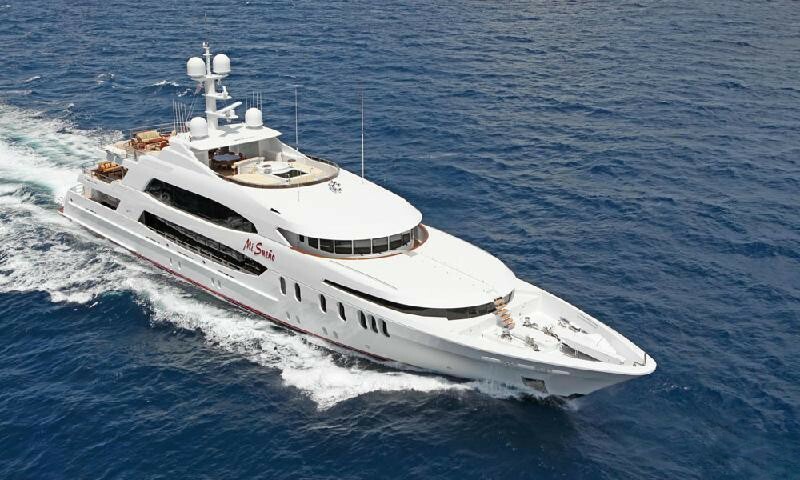 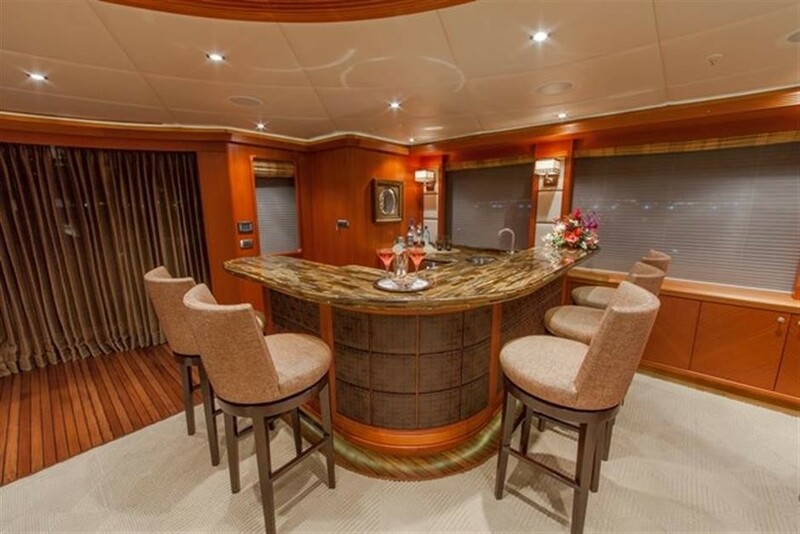 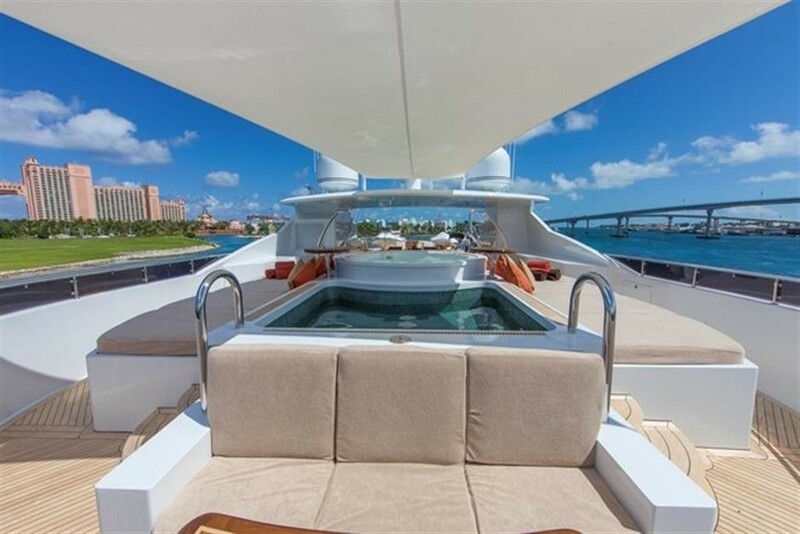 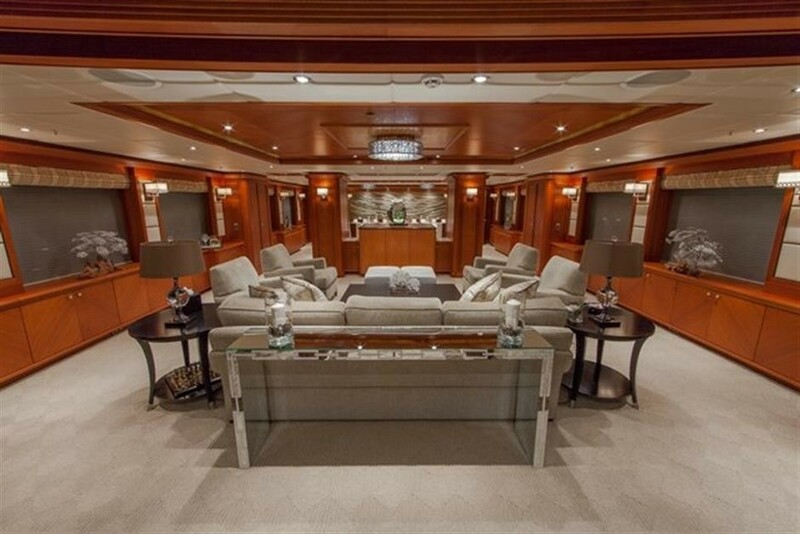 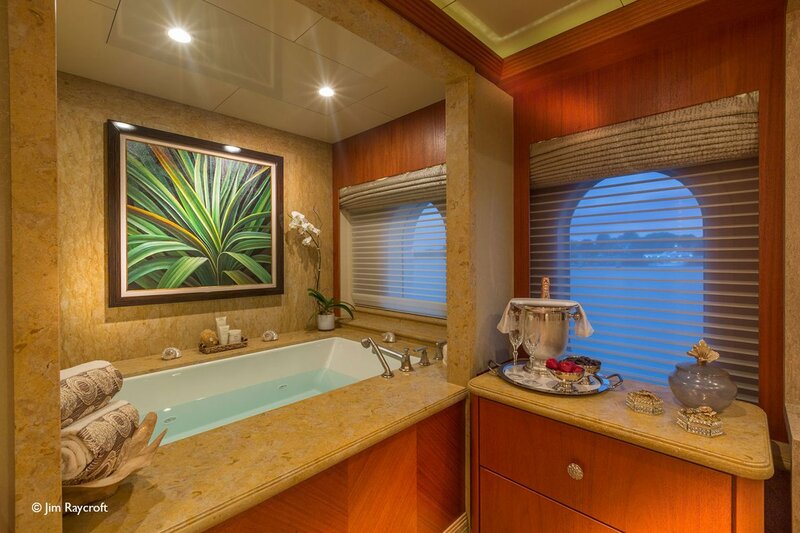 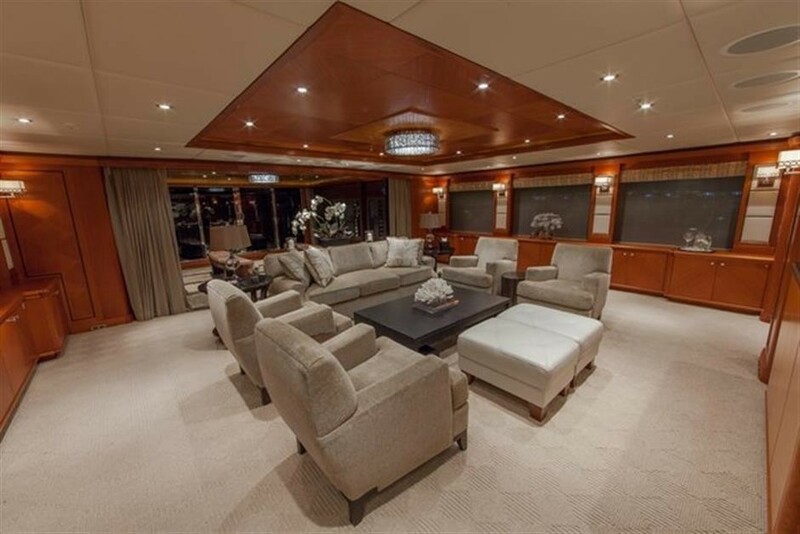 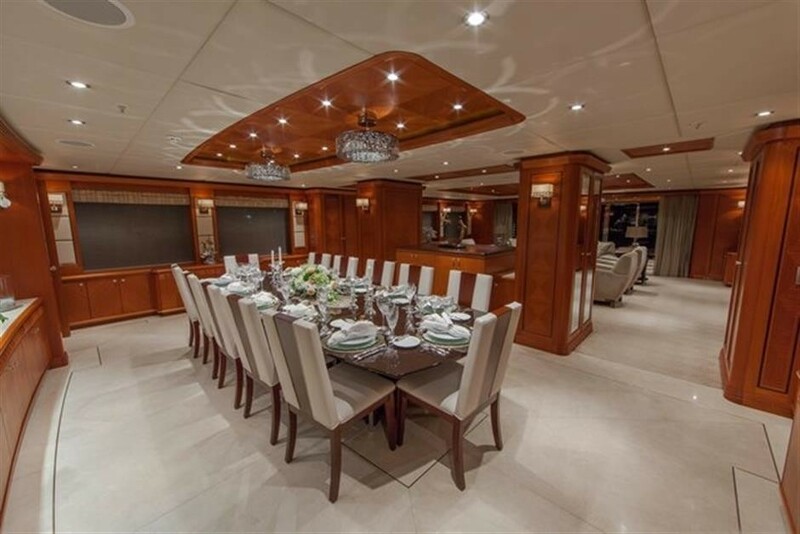 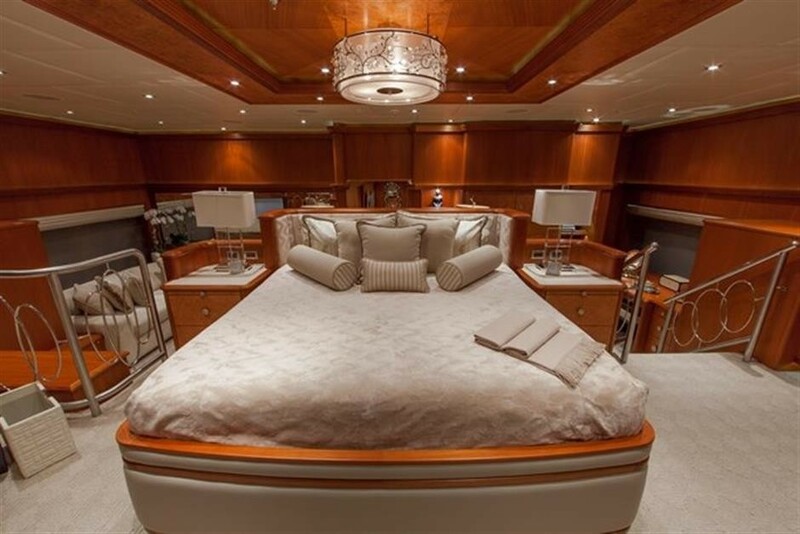 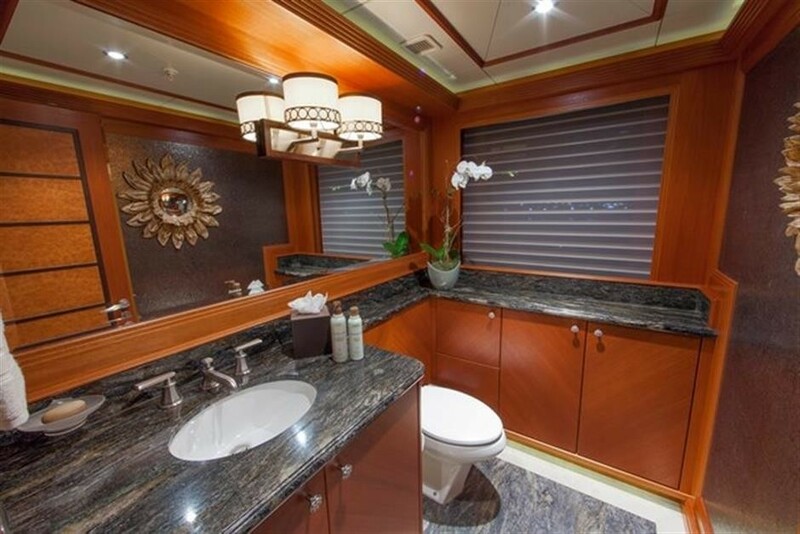 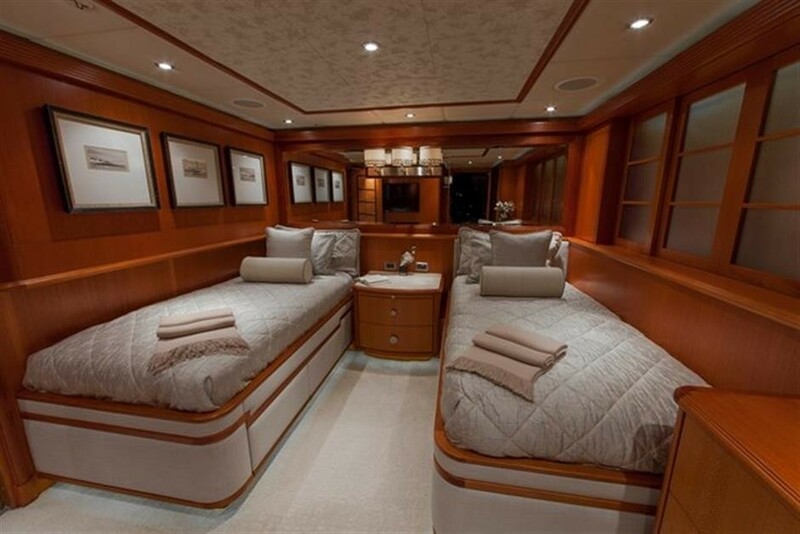 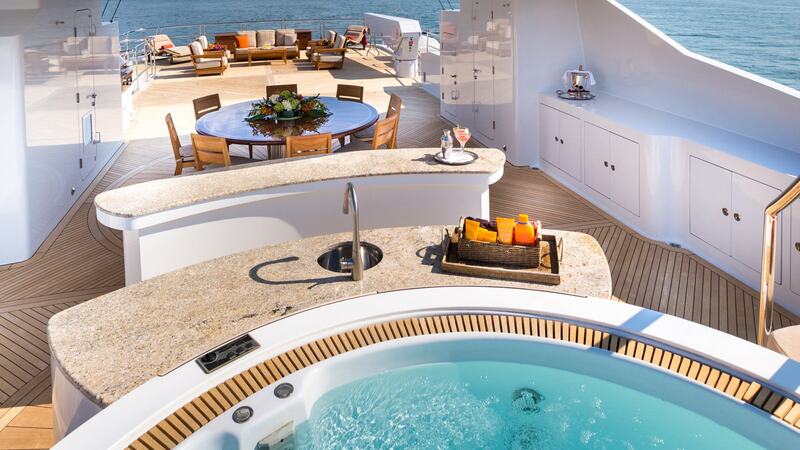 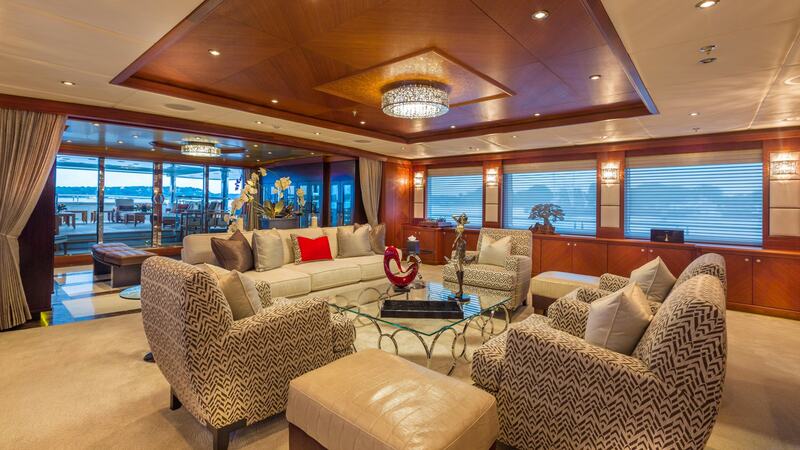 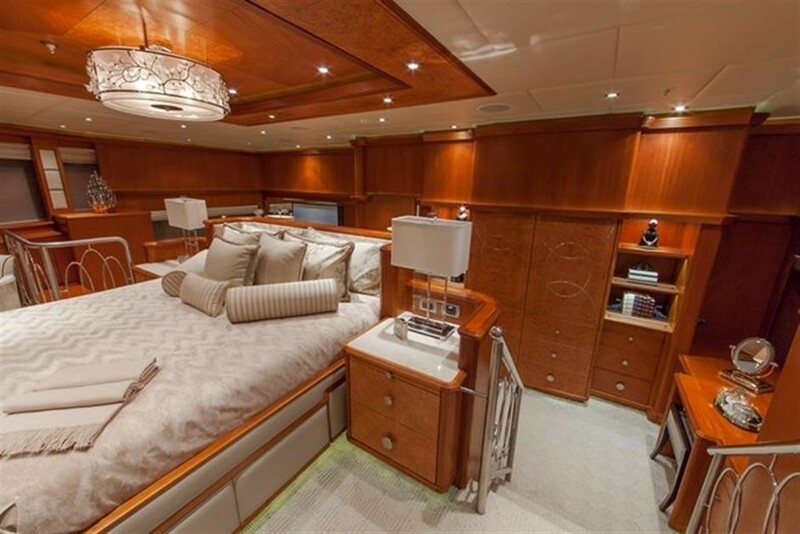 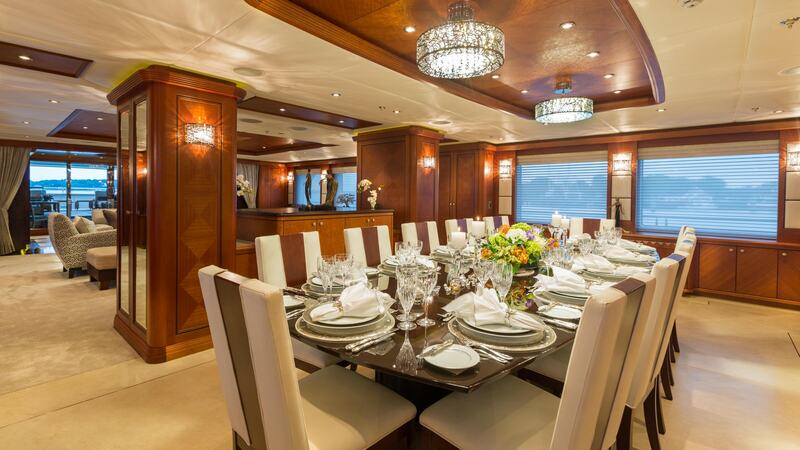 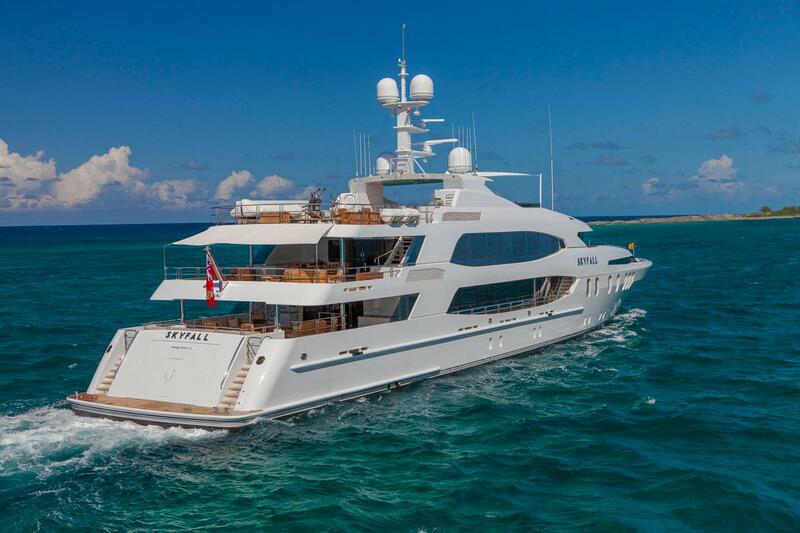 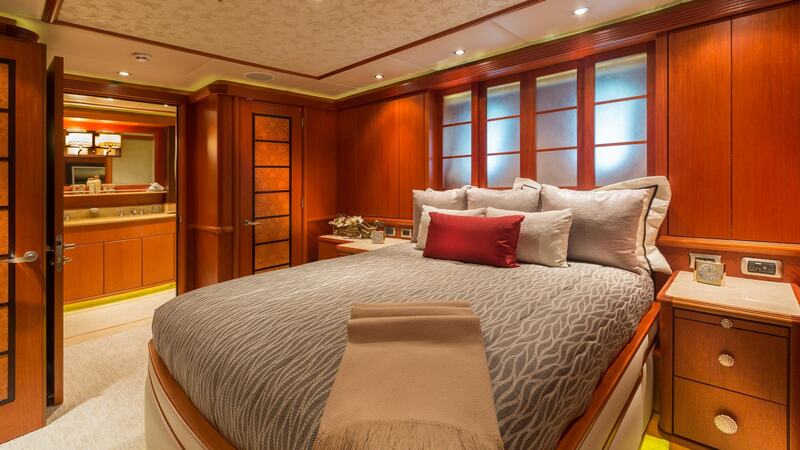 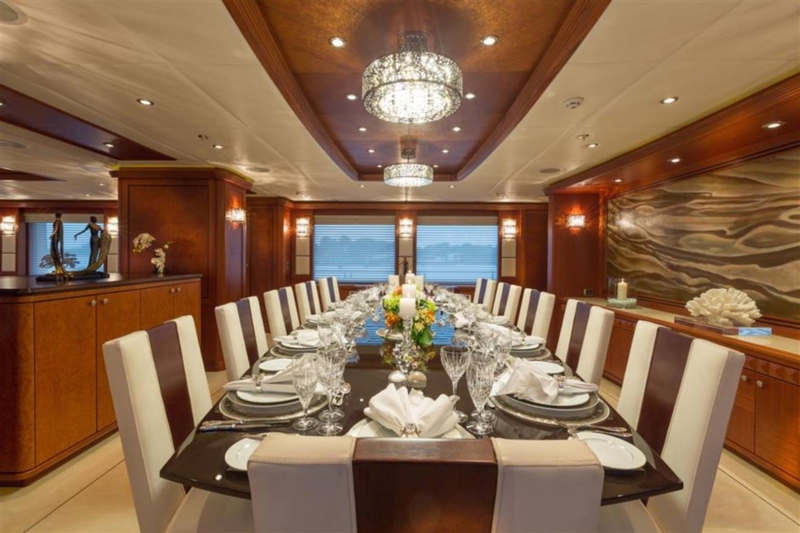 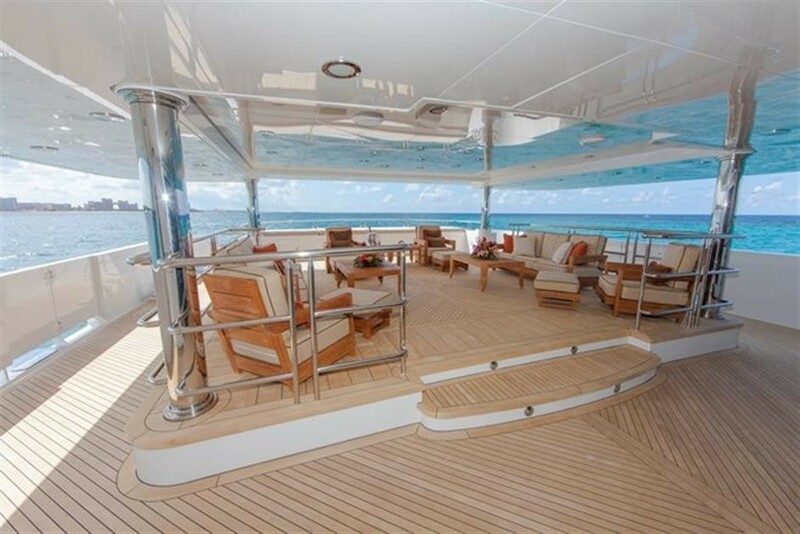 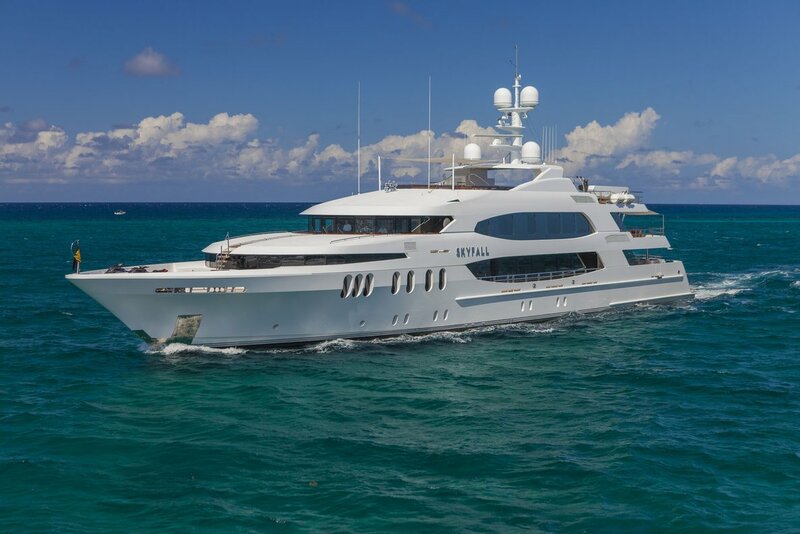 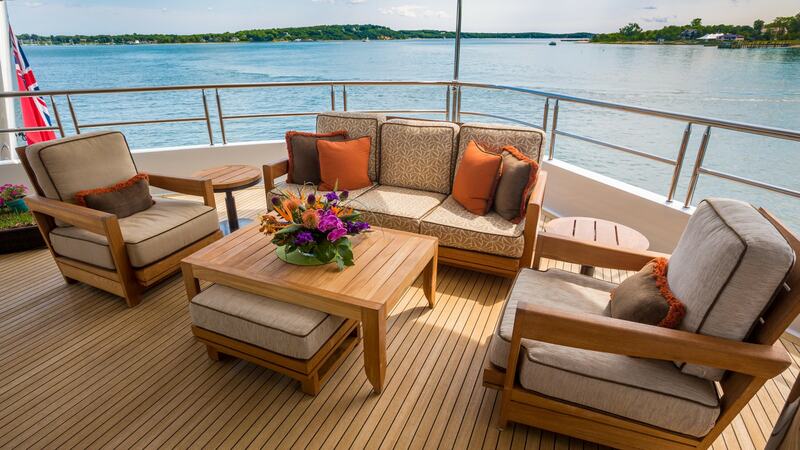 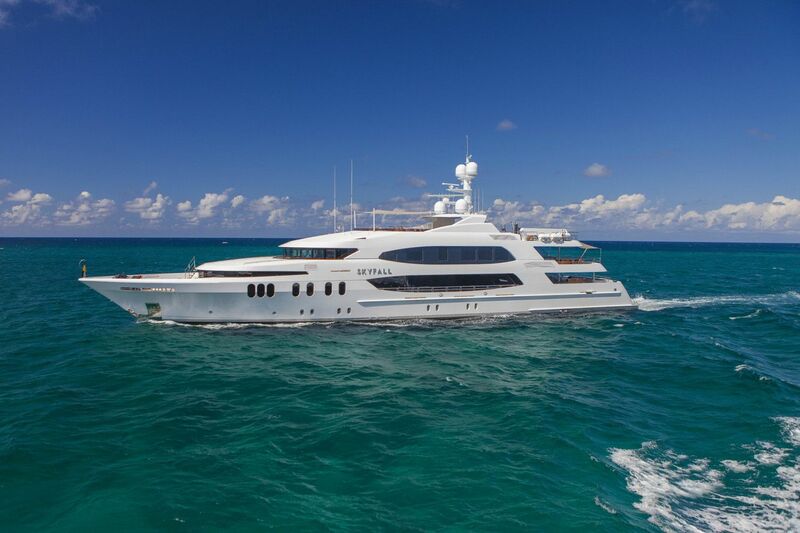 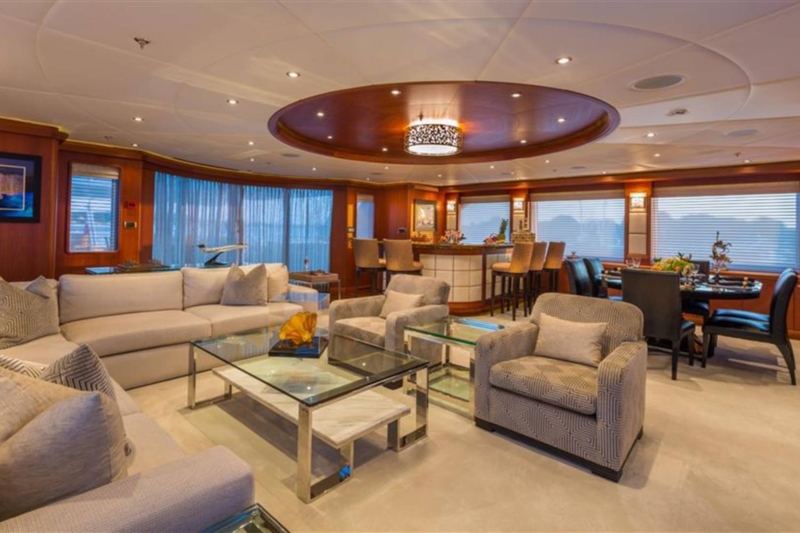 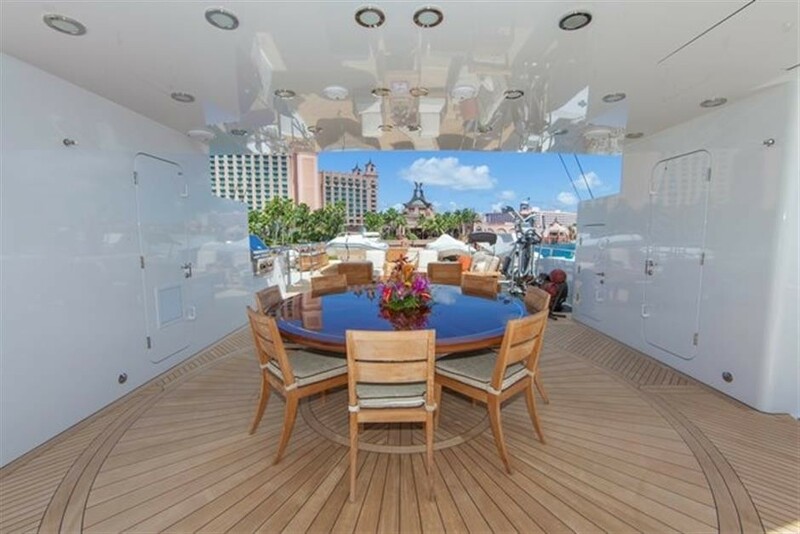 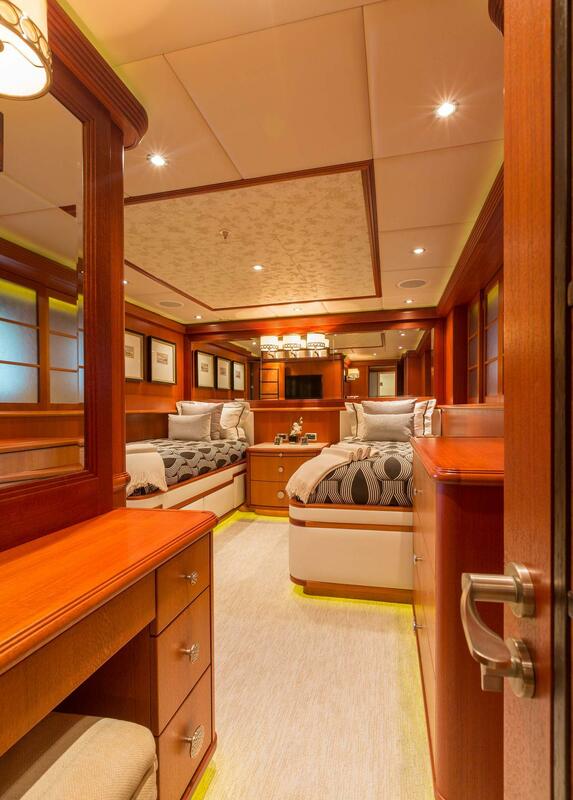 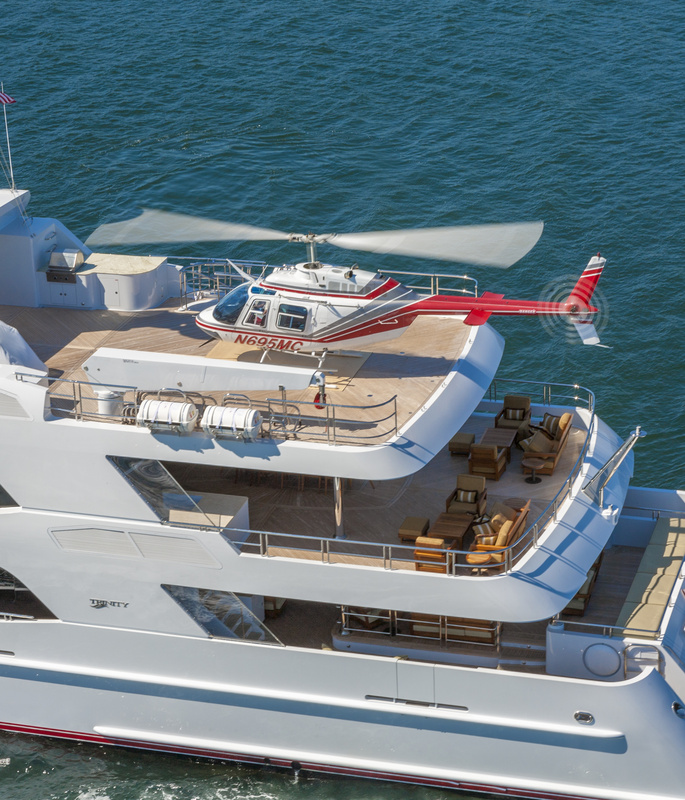 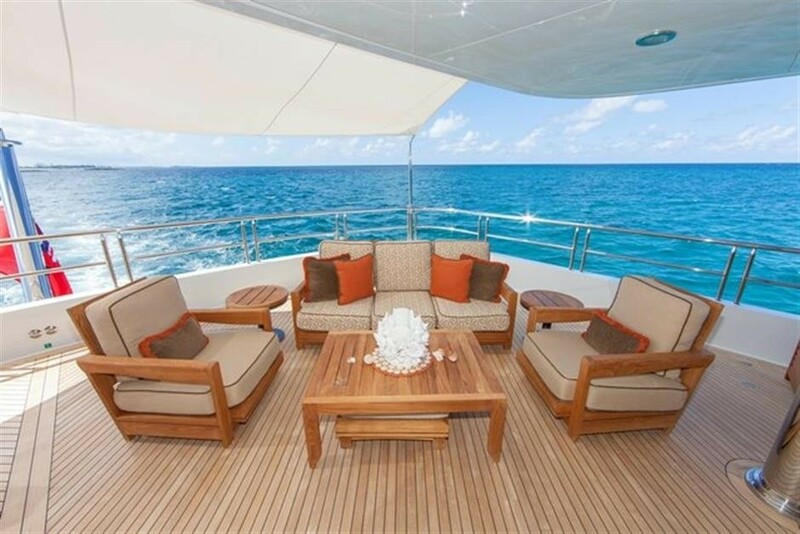 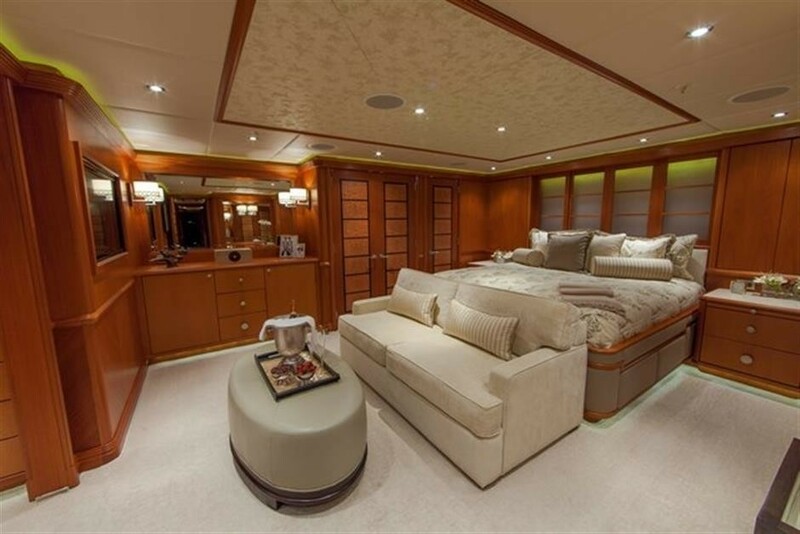 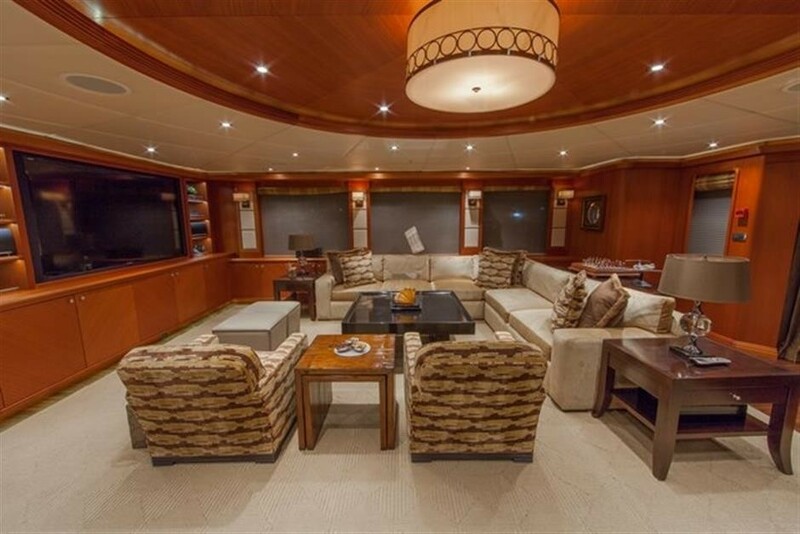 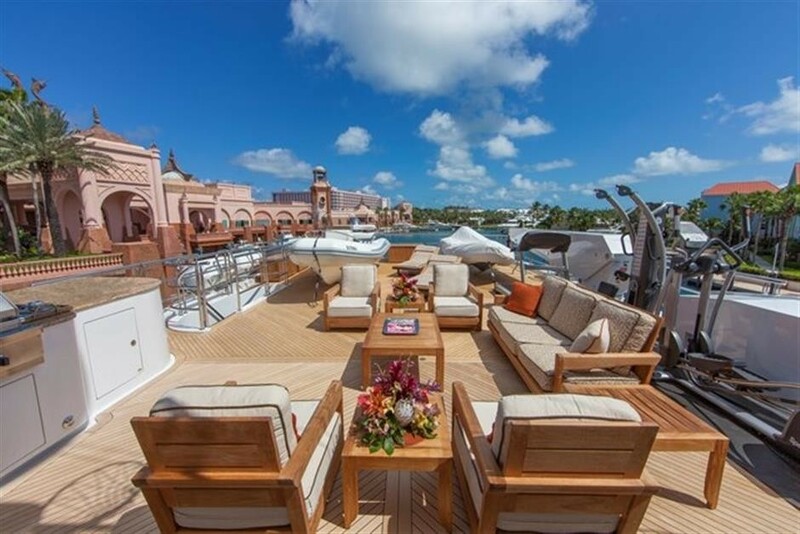 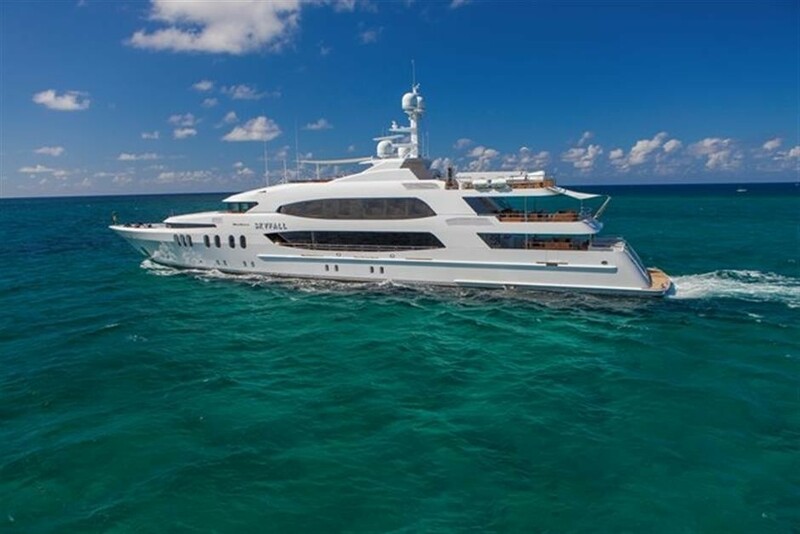 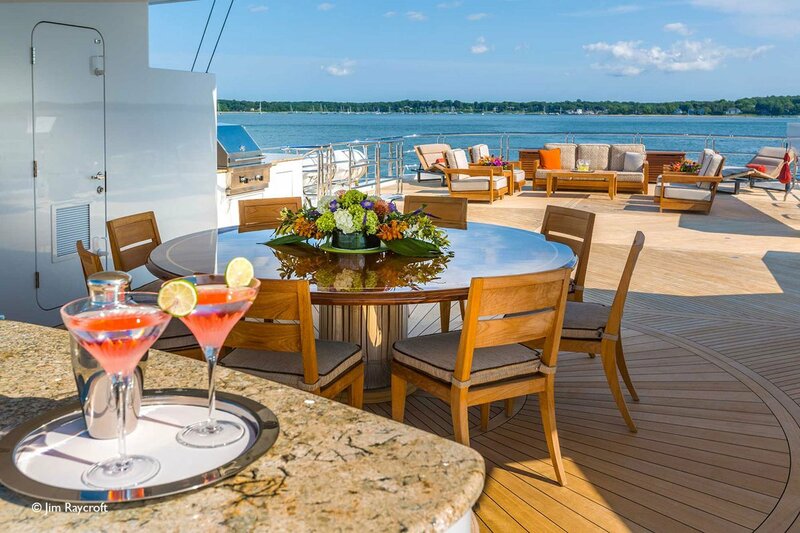 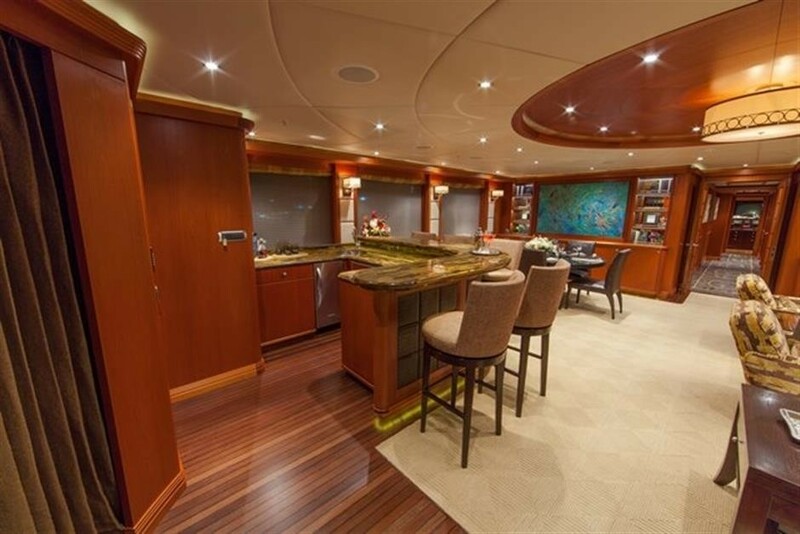 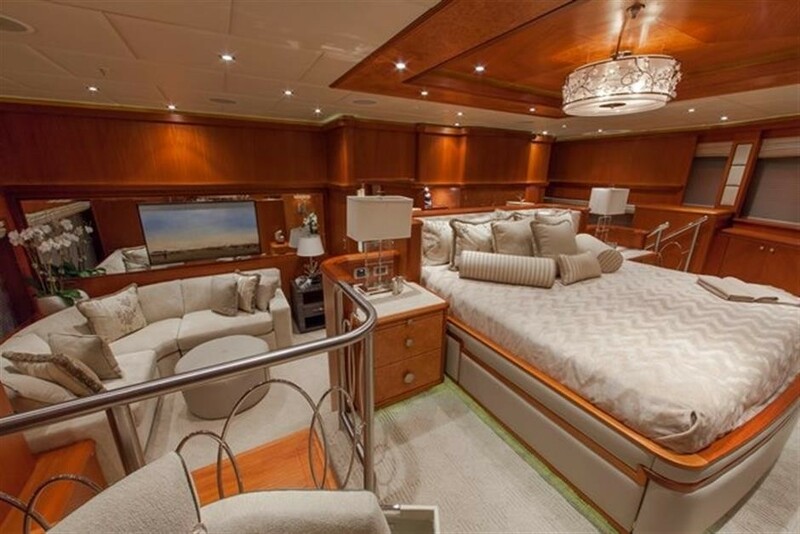 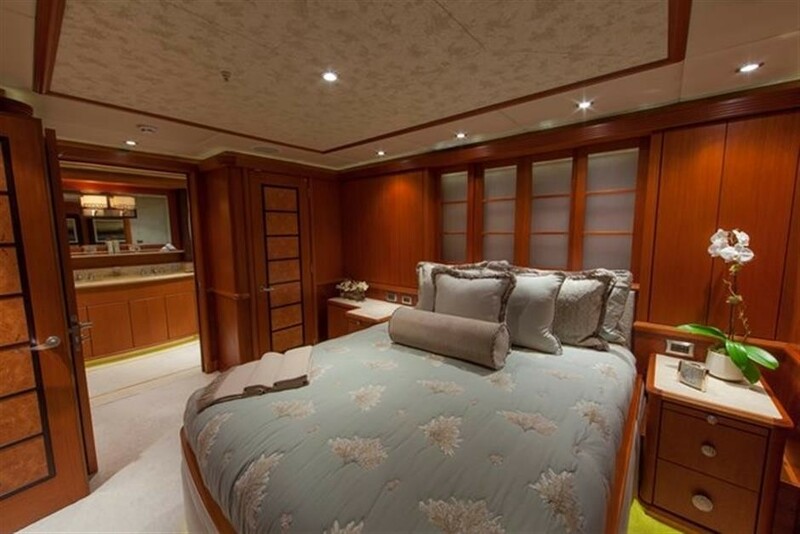 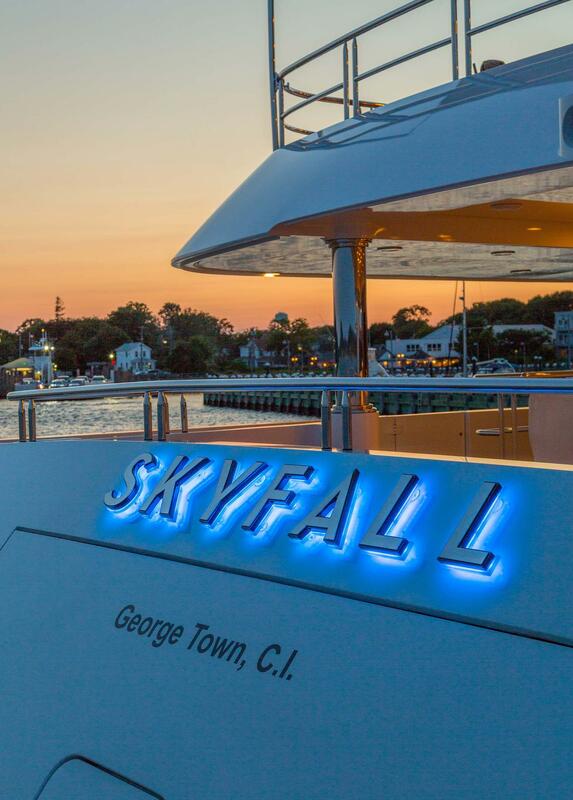 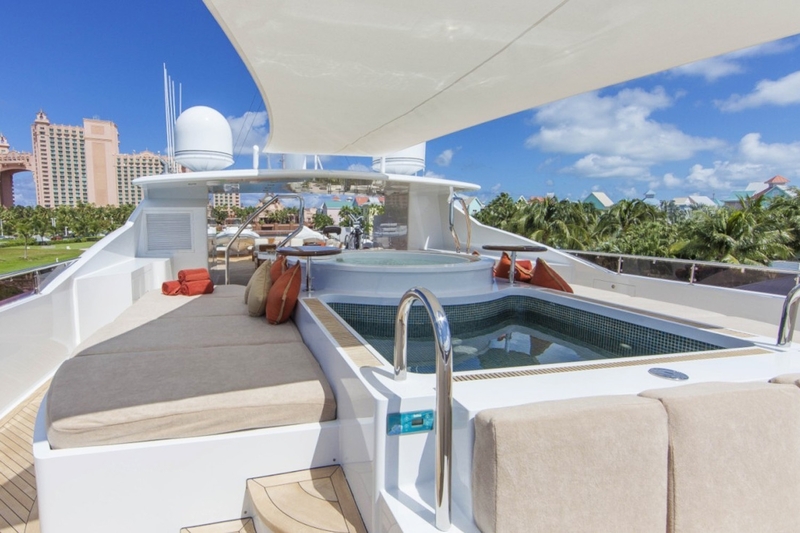 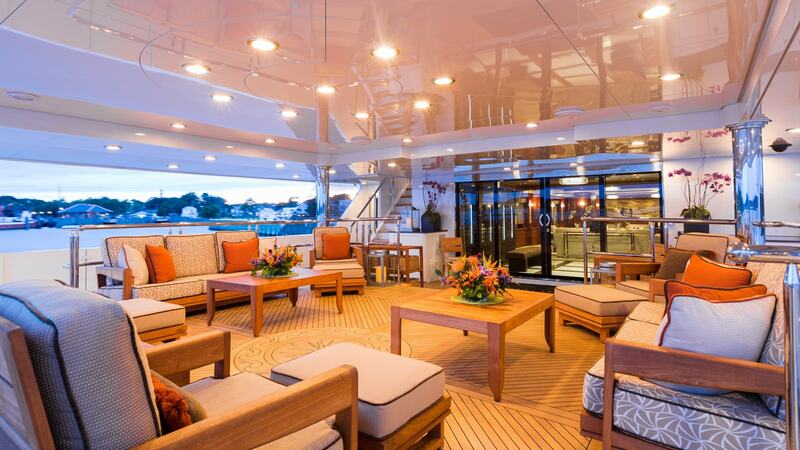 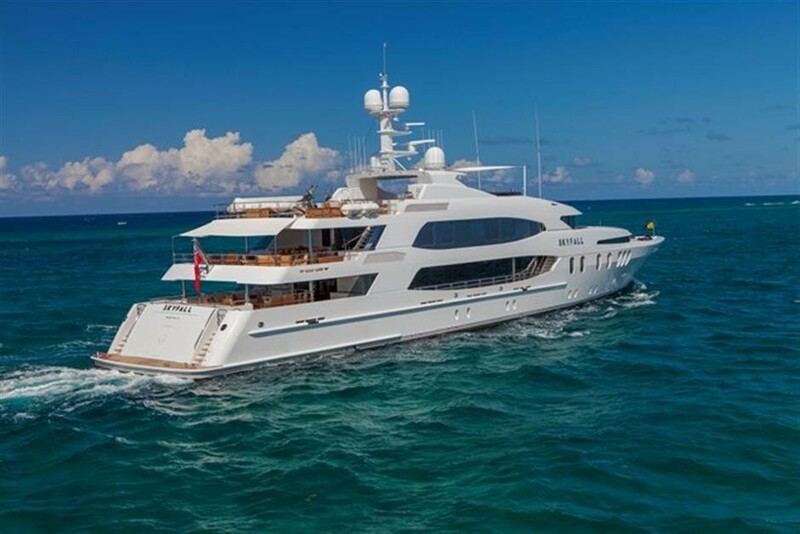 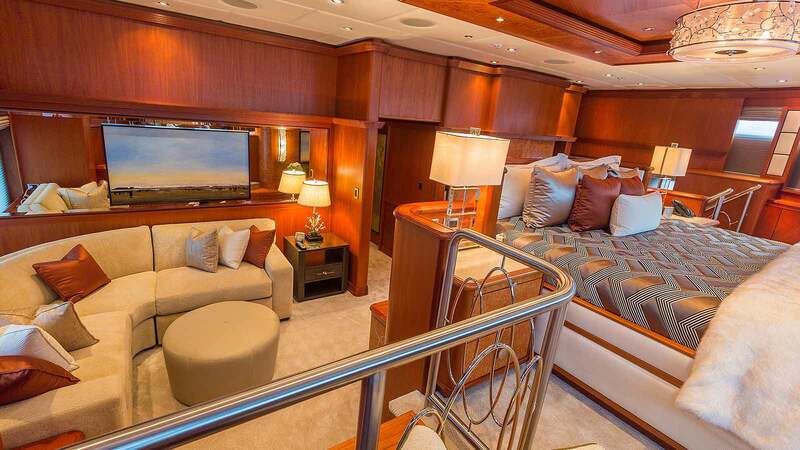 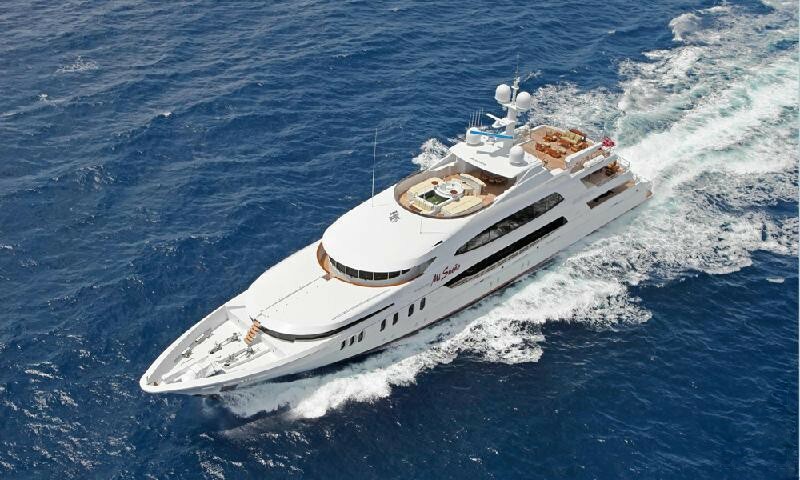 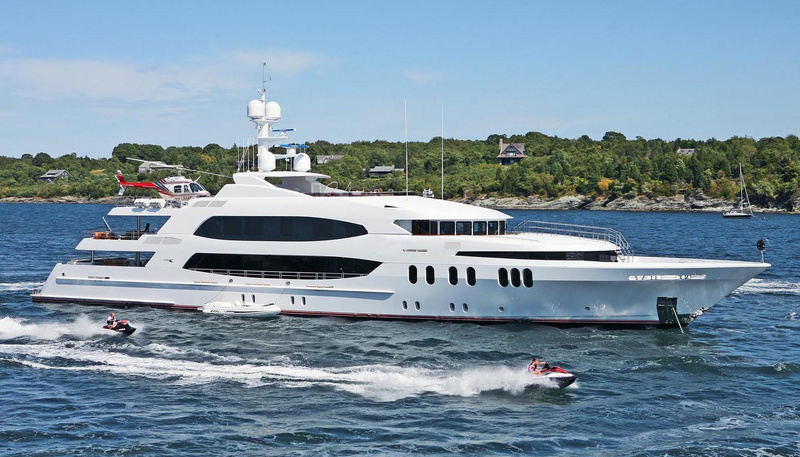 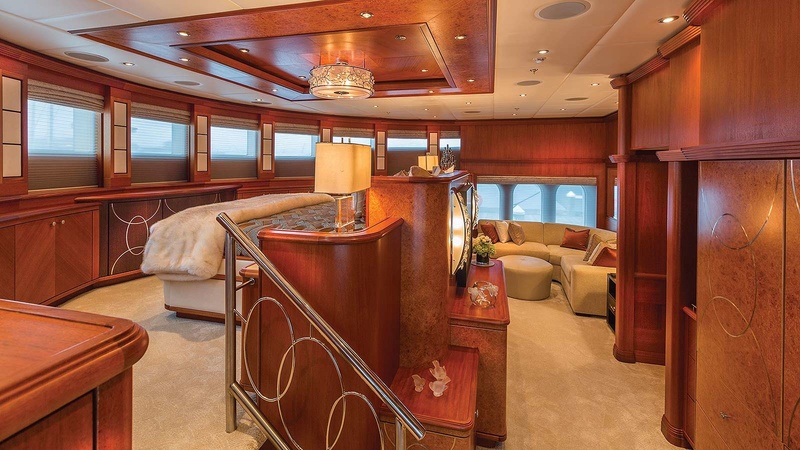 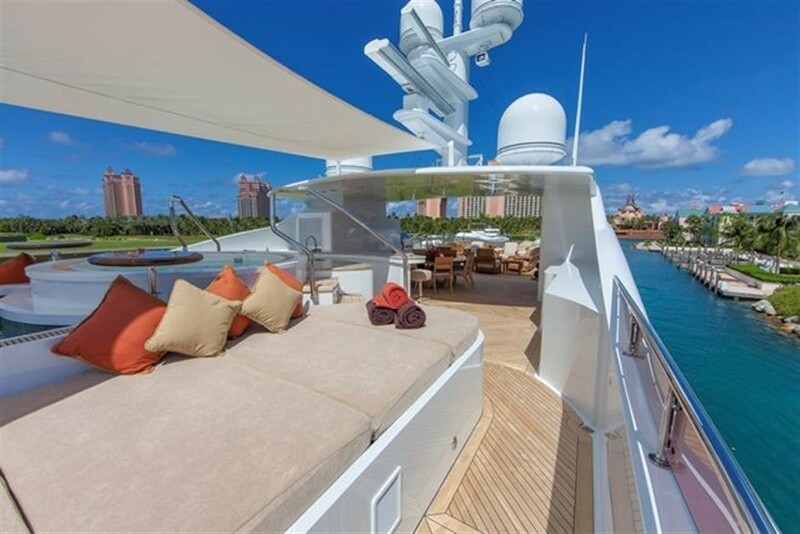 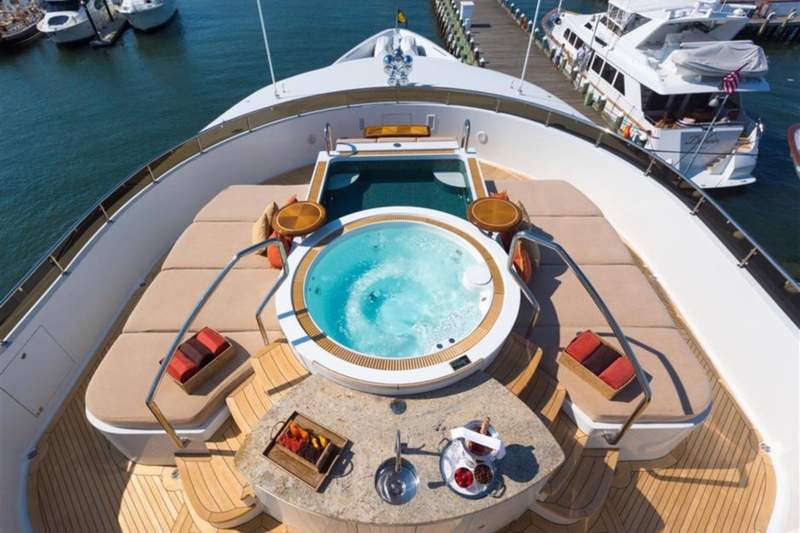 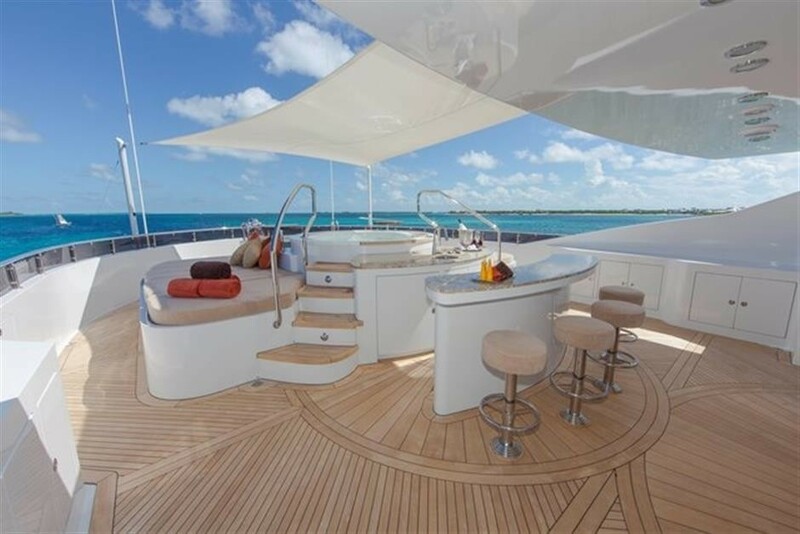 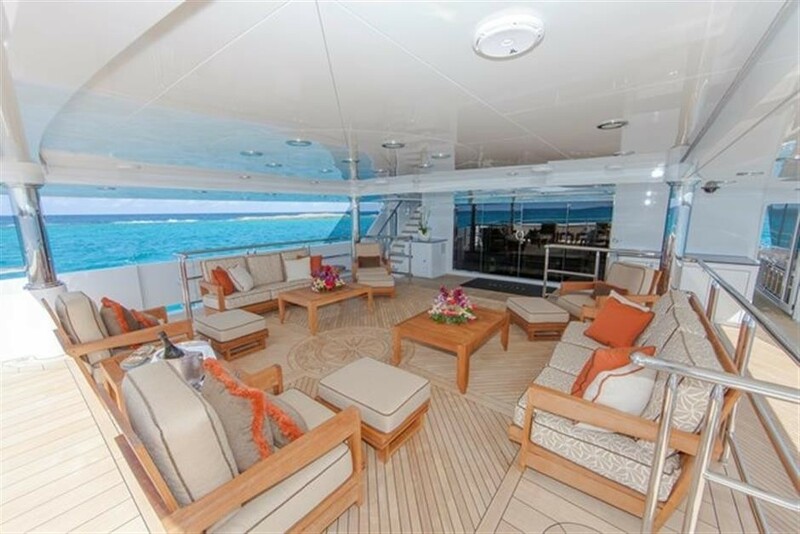 Motor Yacht SKYFALL can accommodate 12 charter guests in luxurious comfort. 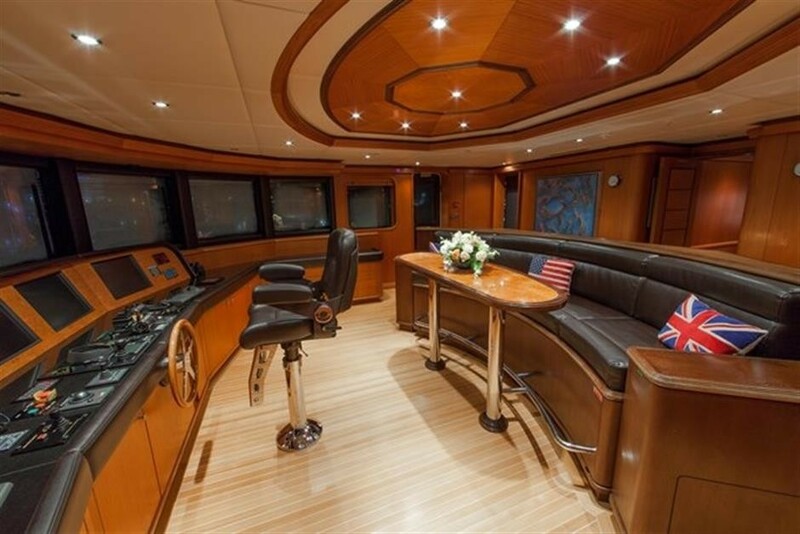 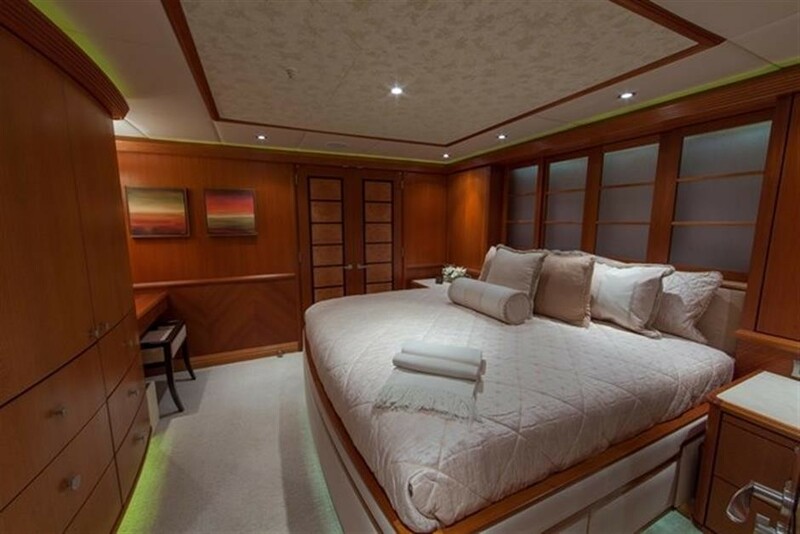 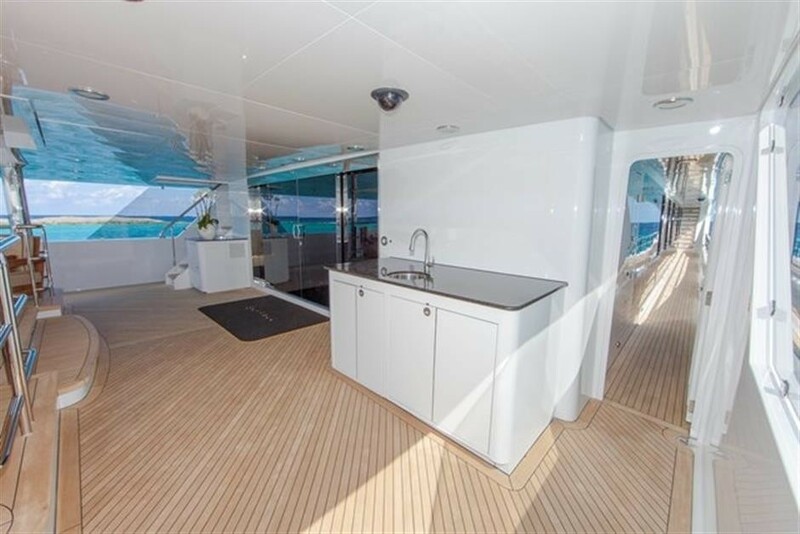 Her master cabin is full beam width on the main deck. 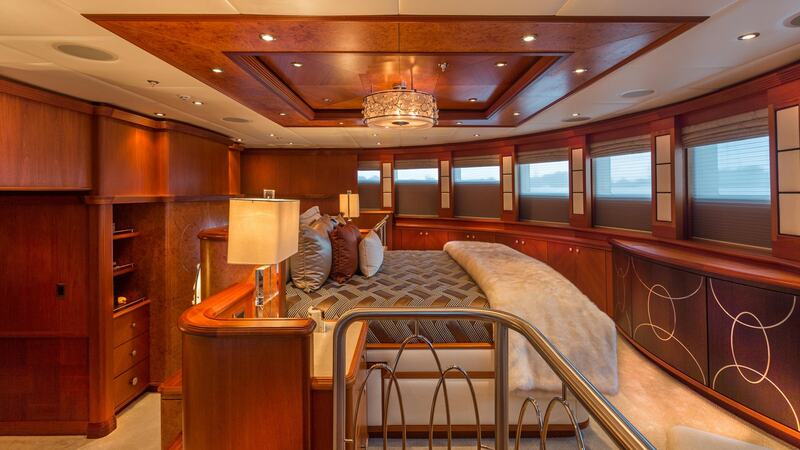 It’s a Split level design with the bed on the upper level with panoramic windows. 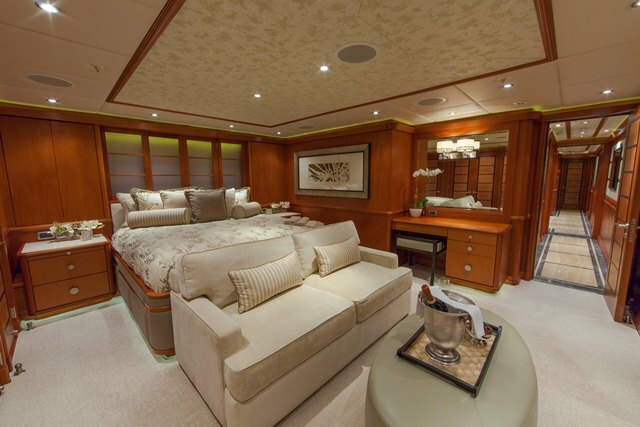 The master suite has a private lounge sofa, desk, 60 inch TV on lower level and a Pop up 60 inch TV by the bed. 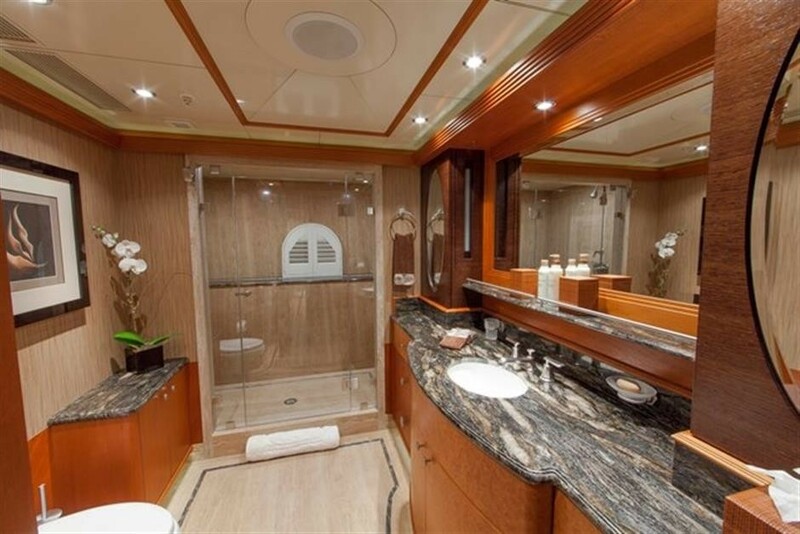 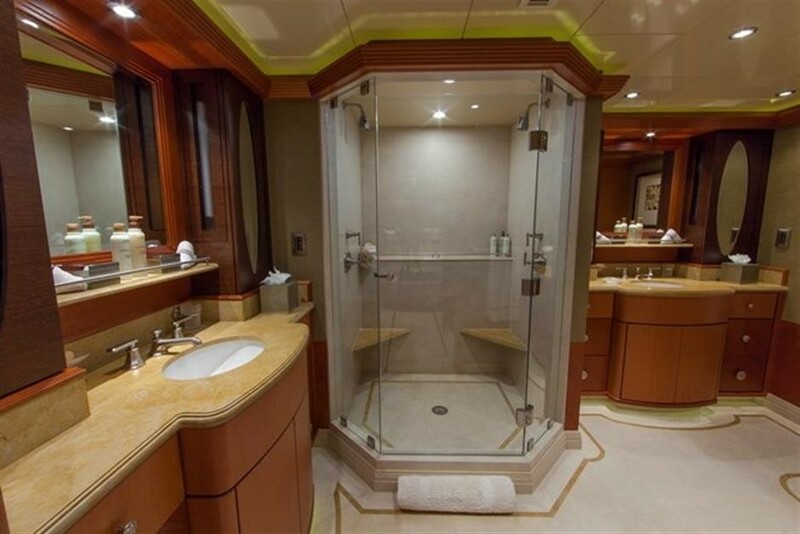 There are His and hers bathrooms with a Spa Pool tub in ‘Hers’. 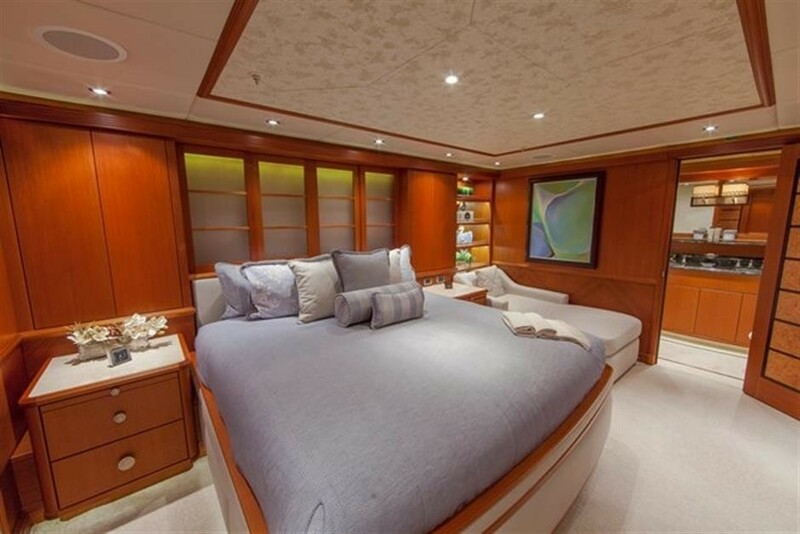 The master suite also benefits from a Private study with desk and a sofa at entrance and this can be closed off from rest of the master suite for extra privacy. 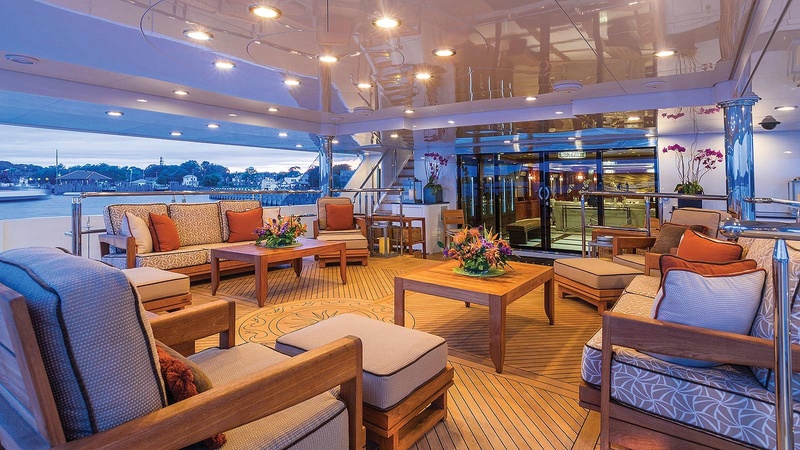 On the lower deck, there are five further guest cabins including three king rooms, one queen and one twin cabin with an additional Pullman berth. 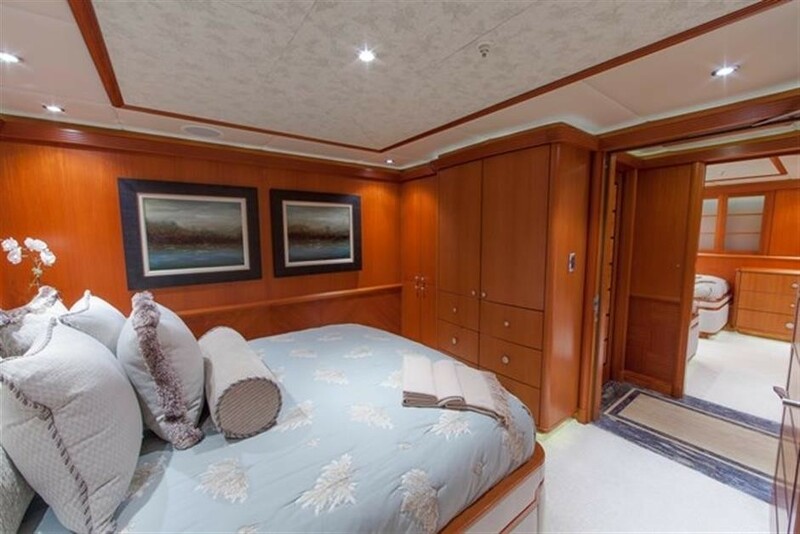 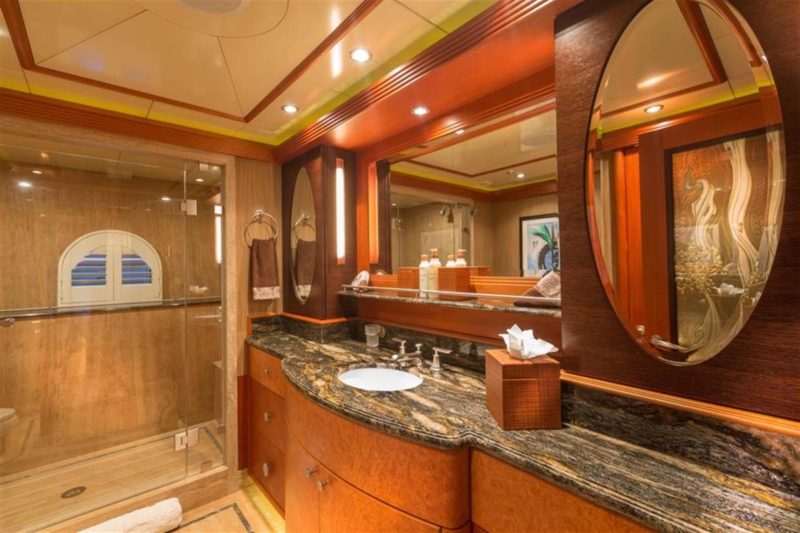 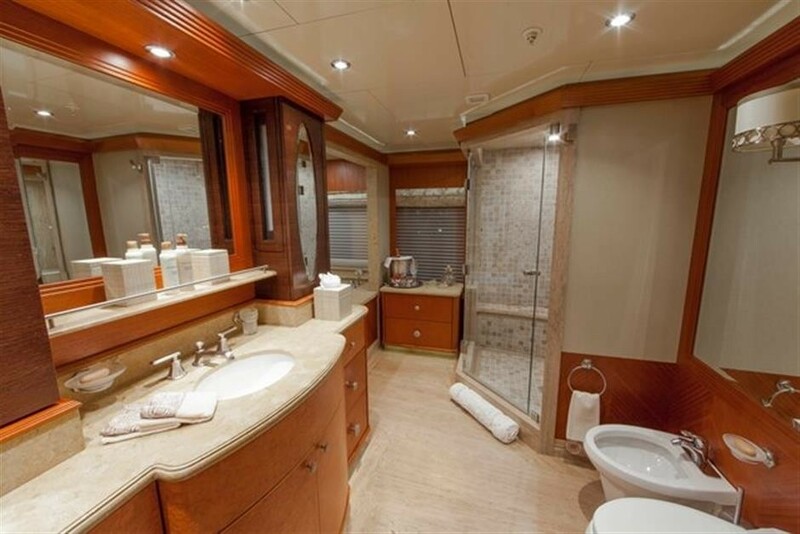 Each of these cabins are fitted with entertainment facilities and private ensuite bathrooms. Luxury Motor Yacht SKYFALL (ex Mi Sueño) is equipped with the following tenders and toys: 23 Low profile CL 700 Novurania tender, 18ft Novurania, 30ft tender model TBC. 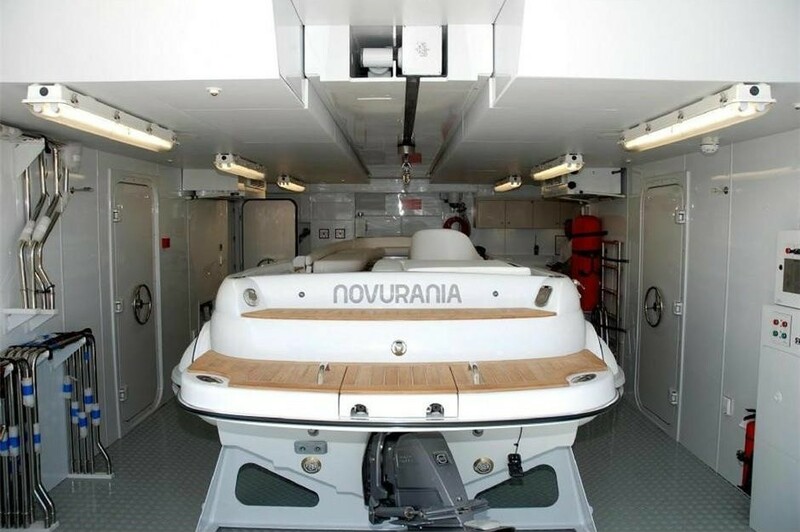 Toys include 2 x 2 person SeaDoo sport waverunners, 2 x Cayago F7 Seabobs, 1 x 4 person banana boat, 3 x donuts, 2 x paddle boards, 1 x wakeboard, 1 x slalom ski, 1 x beginner ski, 1 x kneeboard, 20 x set snorkels, fins. 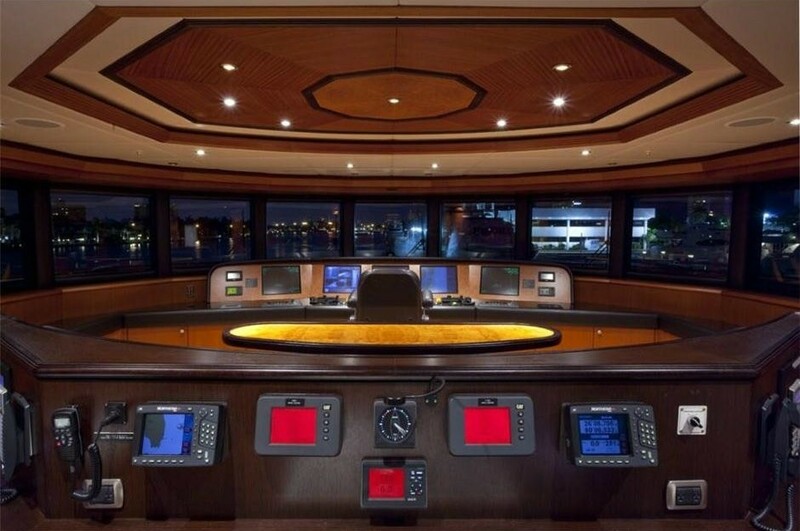 There is also a Monkey swing off the bridge deck aft. 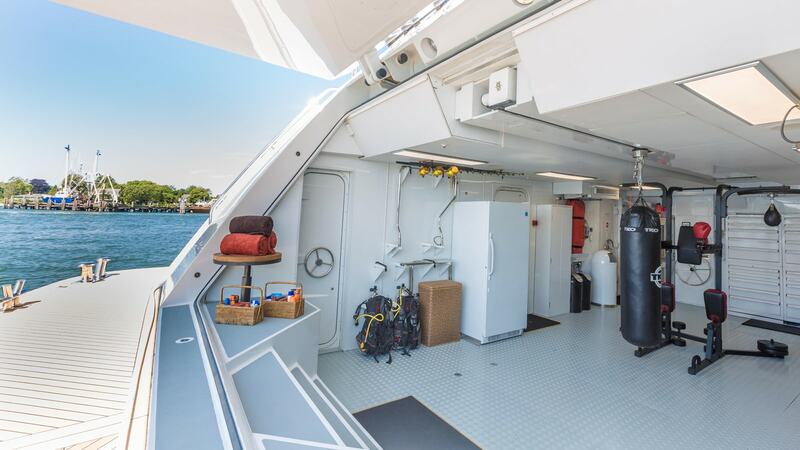 Miscellaneous items include: jetski helmets & goggles, wetsuits, booties & gloves, bouyancy aides, swimming goggles, beach balls, kid's beach toys, volleyball/net, fishing gear (limited), BBQ/beach gazebo, cooler boxes. 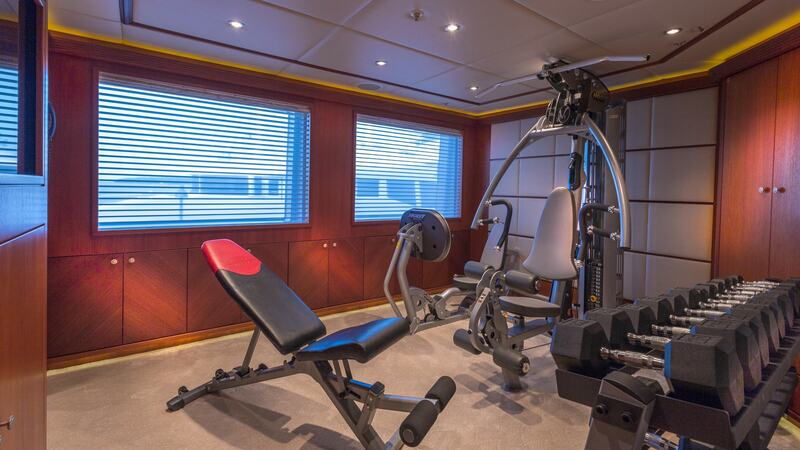 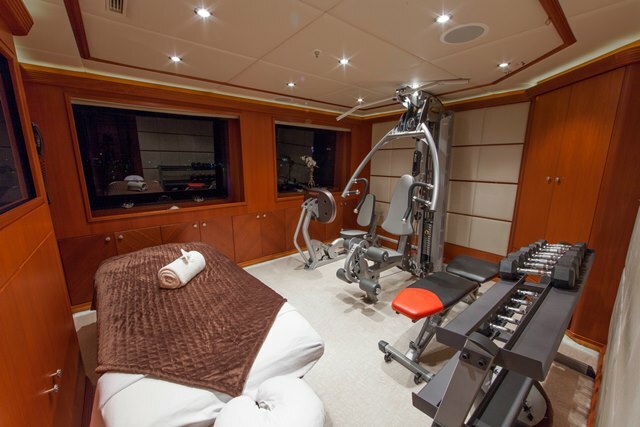 Gym / Exercise Equipment onboard includes: 1 x Woodway Path Treadmill, massage table (portable) 1 x SX Scifit Total Body Elliptical Trainer (located on Sundeck), Yoga mats, free weights /bench, medicine balls, assorted resistance bands, Swiss balls. 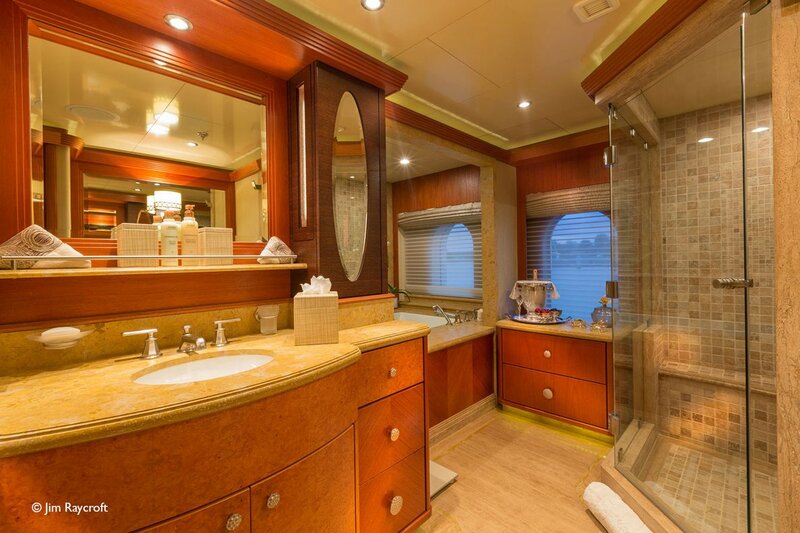 There is WIFI Internet Access throughout.